Did You Know That You Can Eat Flowers? You Didn't? Well, you can, and here are fifty edible flowers, to get you started! My husband thinks I'll eat anything that grows, but as much as he teases me, he knows a lot about eating flowers, too! Come to think of it though, he did have a funny look on his face, the day that I plucked some hibiscus flowers from his bushes, and ate them! Did you know that you can eat the flowers of: borage, roses, hibiscus, moringa, carnation, tiger lilies, squash, garlic, rosemary, violets, plum trees, begonias, geraniums, and many, many more? Oh, I see...some of you did, and some of you didn't. Well, after you read about some of these flowers - you'll all know which ones are edible. You are never too old to learn, and we think these are some of the tastiest, best edible flowers to eat! So, let's see what flowers you can add to your diet. Some flowers aren't just beautiful, they are edible! There are 50 edible flowers listed here, to get you started! 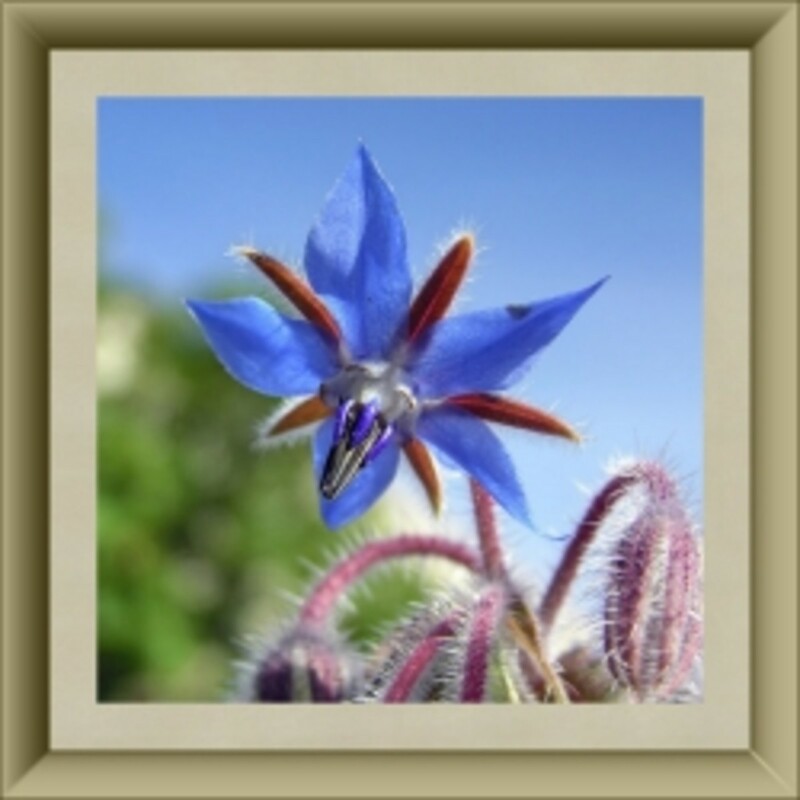 This incredible red, white, and blue blossom is the first of our edible flowers - BORAGE! See below, for how the flowers look, how they taste, how to use them in the kitchen, and some interesting facts about how they have graced our ancestors' tables. Borage, Carnations, Moringa, Roses, Violets, Tiger Lilies, Red Clover, Pansies, Lilacs, and Nasturtiums. 2: Carnations - Not Just For Show! I'll bet you didn't know that carnations are not just for bouquets and boutonnieres - but can be eaten, too! They are used extensively in ethnic desserts, and are one of the 130 different essential plant ingredients used in the ultra-secret recipe for the renowned French beverage, Chartreuse. Grown all over the world, carnations just happen to be the national flower of Spain, and the scarlet carnation is the official state flower of Ohio. On the Dave's Garden website, we found a recipe dating back to 1629, for Carnation Pickle. Now, that's just plain interesting, and the article that accompanies it, is too. Take a moment to read it, as it is very historically enlightening, and you just might like to try it! Now, how often can you get your hands on a recipe that is almost 400 years old? I'll answer that. Not - very - often. Word is - eat them in moderation, and make certain you are eating a carnations that are organically grown, pesticide-free, and a variety that is known to be safe. 3: Moringa Blossoms - Yum! From a moringa lover - that would be ME - it should come as no surprise, that you can eat the flowers from moringa trees. This a photo of some of mine, growing from my dearly beloved moringa oleifera trees that are only about 1½ years old. See the little flower buds? They are edible, too! Both the flowers and the buds should be lightly cooked before eating, and you can make a delightful tea, reputed to be good for just about "whatever ails you"! Traditionally, in their native countries, they are eaten to alleviate a cold, but I don't get colds, so I couldn't say if they help, or not! When they are lightly sautéed in a little water, with a touch of butter, or olive oil and garlic and salt - just until they "wilt" - um, um...good! They taste like the softest, most delicate vegetable you have ever eaten; NOT like mushrooms, as is the general consensus. We use them in our own recipes for: Moringa Spinach Artichoke Dip, Moringa Pizza, Moringa Onion Manchego Omelette, Portabello Mushroom Moringa Tower, Meatless Moringa Wholegrain Leafloaf, Moringa Garlic Quinoa, Moringa Guacamolé, and several others. WARNING - We have read from two sources, that expectant mothers should not eat the Moringa blossoms, as there is reason to believe that they could act as an abortifacient. Please exercise caution, as we do not want to be the cause of a woman losing her baby! 4: Don't Smell The Roses - Eat The Roses! The state flower of New York, is the rose. Does there exist a more exquisite flower? Personally, I am torn between my husband's orchids, and roses. He grows quite a few stupendously magnificent ones, but - I would not dare to suggest eating one! But, roses? That's a different story, altogether. According to my research, all roses are edible. Not only are their "rose hips" loaded with Vitamin C, but the petals are also nutritious, albeit a bit "perfumery" to the taste buds. Rose blossoms can be incorporated into many main dishes. I found them in recipes using quail, chicken, beef, and pork. They have also been used in aged beverages, spice blends, homemade bread, muffins, ravioli, pasta, soup, stew, quiche, jellies, syrups, candy, and ice cream or - they can be used as an elegant garnish to any entreé. The best part is - you can eat the garnish! Here are just a few, to "wet your whistle": Rose Petal Butter, Honey Glazed Chicken with Roses, Rose Petal Bread, Rose Petal Jam Linguine, Rose Pesto, Rose Turkish Delight, Persian Rose Cake, Rose Cheesecake, Pickled Rosebuds, Scrambled Rose Omelette, Rose Tuna Salad, and Rose Petal Sorbet. As far as violets go, I eat them! How about you? 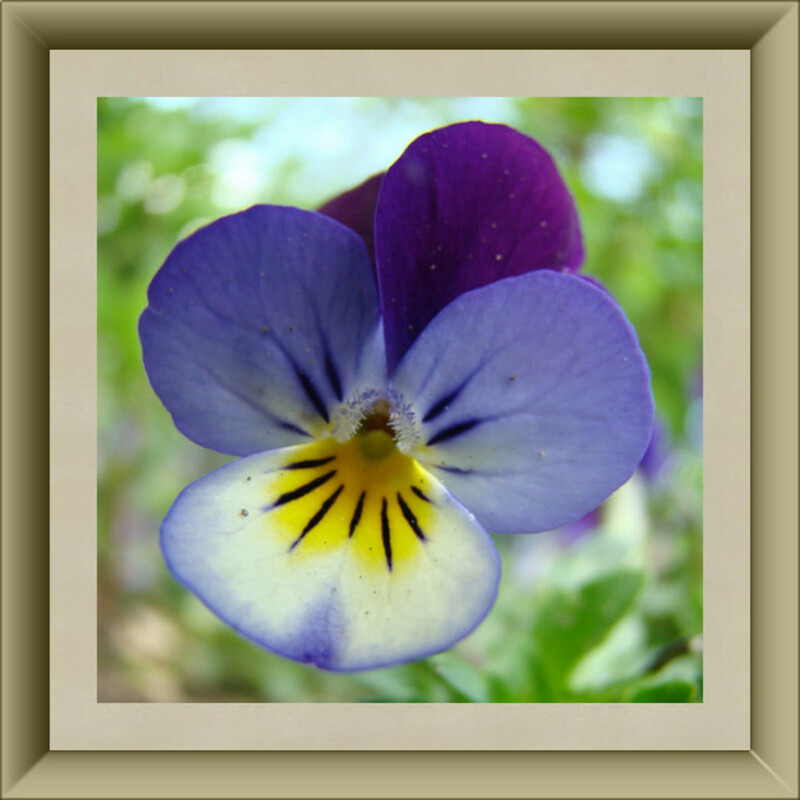 If you would like to grow your own edible violets, but have trouble getting them to cooperate, try checking out the USDA Plant Database page for Viola. On that page, down toward the bottom of the page, you can see which variety thrives in your area. Evidently, violets grow just about everywhere on the North American continent, and we know they are grown by violet lovers, all over the world! Illinois - the native violet - Violacea. They are such delicate, beautiful flowers, and have been known as edible flowers for many centuries. 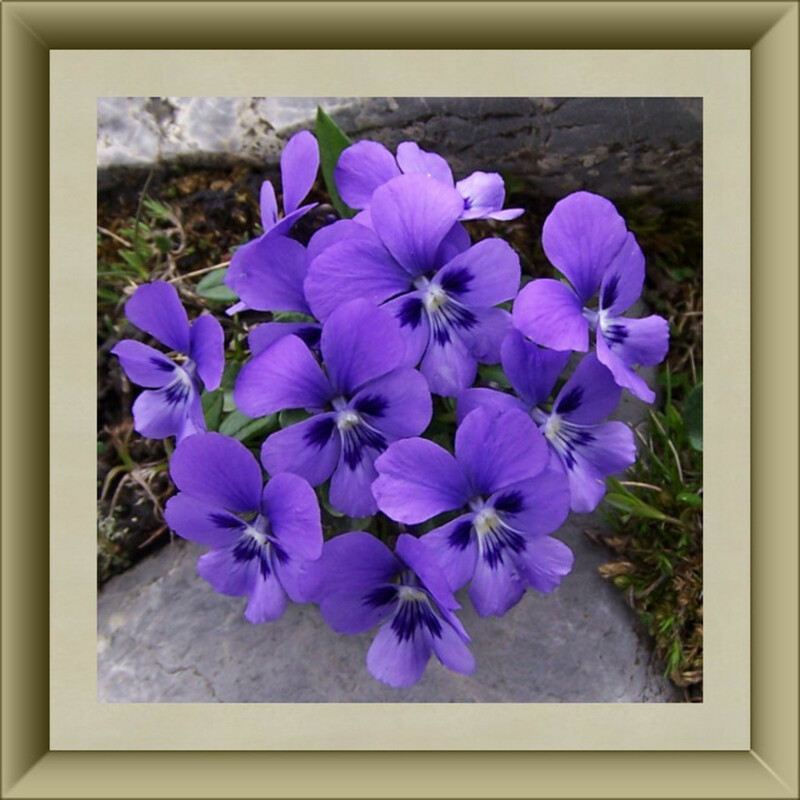 One old recipe, on the "web", listed violets combined with wild onion in a salad. Some old cookbooks list: Violet Jelly, Violet Mustard, Violet Soup, Violet Salad, and Violet Pudding. Some of the cookbooks featured here, offer recipes with violet flowers in them. All seem to agree that they are nutritious, and delicious! 6: Tiger Lily - They're Nothing Like A Tiger! Well, they have orange and black in them, but that's as far as it goes. 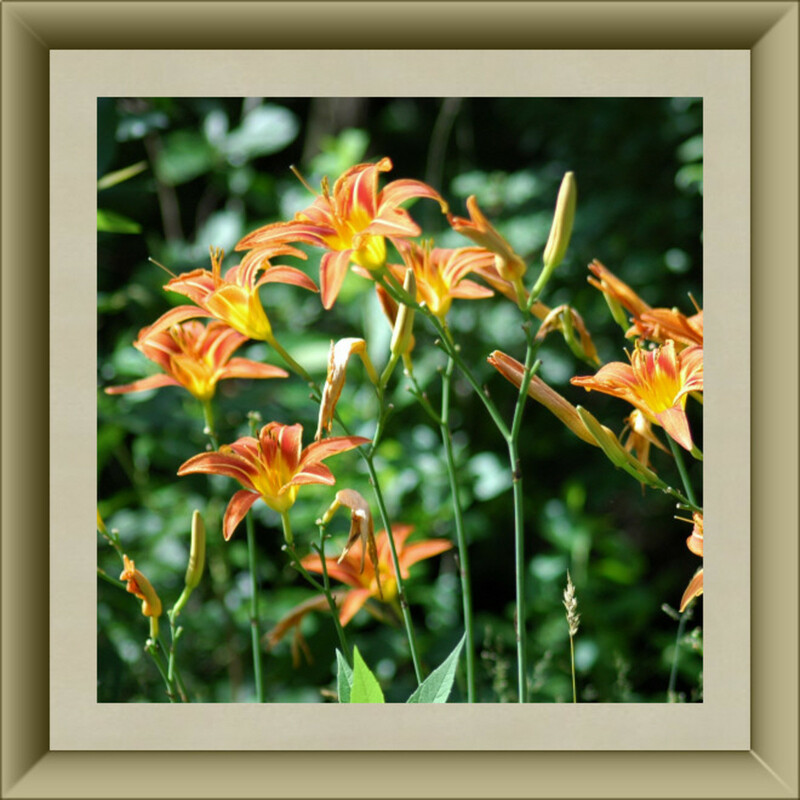 Once, we had a mass of tiger lilies growing in our yard, but very few ever got to bloom, because I ate the buds! They are simply delicious, sautéed lightly, with a touch of butter, garlic, and sea salt, but I usually ate them raw. 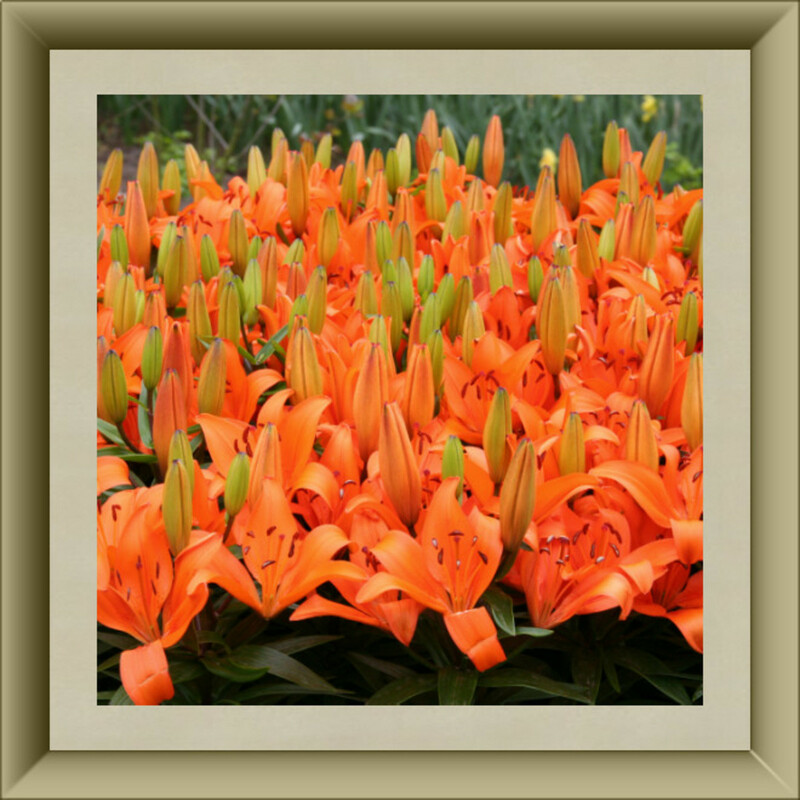 Botanically speaking, the tiger lilies that we had, were Lilium lancifolium, which was formerly called Lilium tigrinum. In Florida, where I am located, I understand that they are on the endangered species list. I didn't KNOW that, when I was blissfully consuming them! Oh, well - they had lots of blooms, and I didn't eat anything but the flower buds, so I don't imagine I'll be in trouble for that! 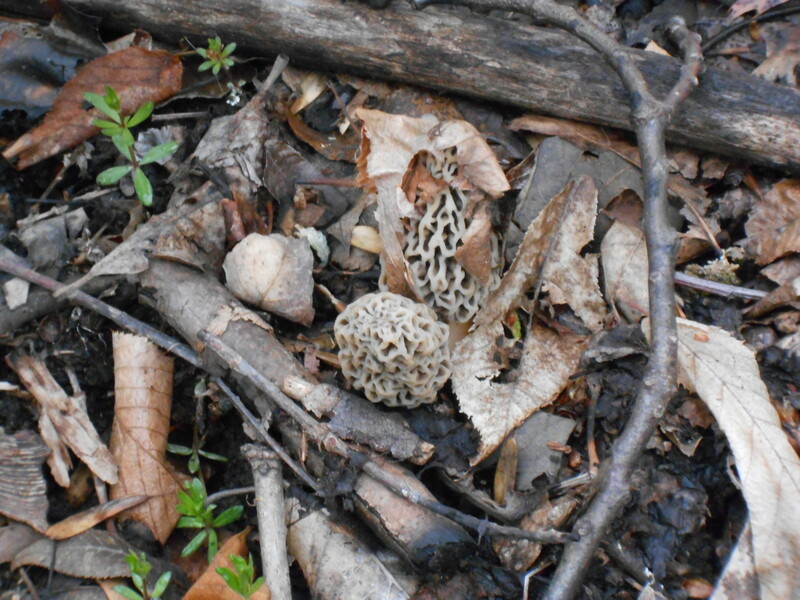 If you have them growing in your yard - sample them, but don't eat the bulbs! We want these flowers to propagate, and be around for a long, long time. They are a welcome change to the standard vegetables that we've grown accustomed to eating! 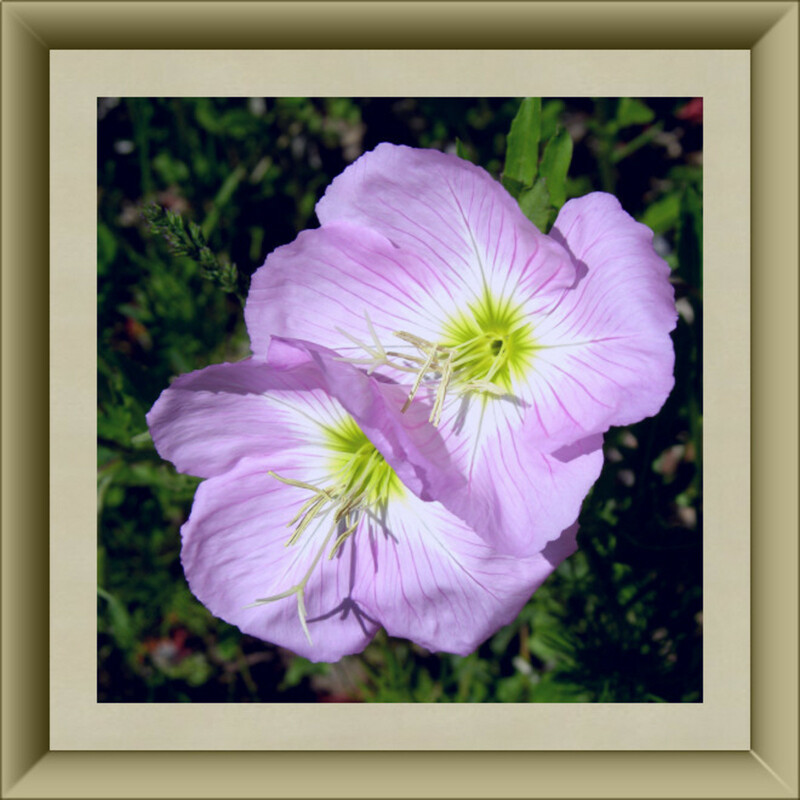 Another of my favorite edible flowers. When I used to pluck plump red clover blossoms, and pop them into my mouth, I didn't even know that they were good for you! I just liked them, and still do. 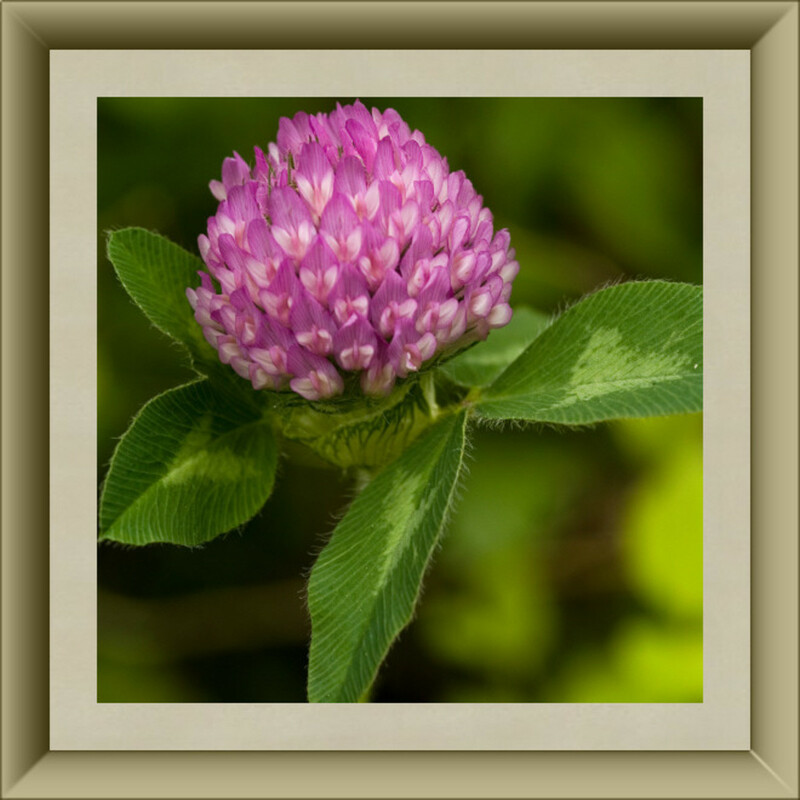 Red clover is the state flower of Vermont, and the national flower of Denmark. One variety or another, can be found in all 50 states, here in America - and it grows profusely with very little care. Traditionally, red clover has been honored as a powerful blood cleanser, but it has also been a time-honored ingredient in rice dishes, soups, spreads, cornbread, lemonade, biscuits, pancakes, drinks, and desserts. We found these red clover recipes, online: Red Clover Almond Biscuits, Red Clover Pancakes, Red Clover Rice, and Rose and Clover Jelly, just to name a few. Over the centuries, red clover has found a niche in flavoring many different edibles; one of the most prominent being - cheese. Red Clover Aged Cheese...doesn't that sound like a delight to the eyes? Oh, I was so excited, when I found out that you can eat pansies! 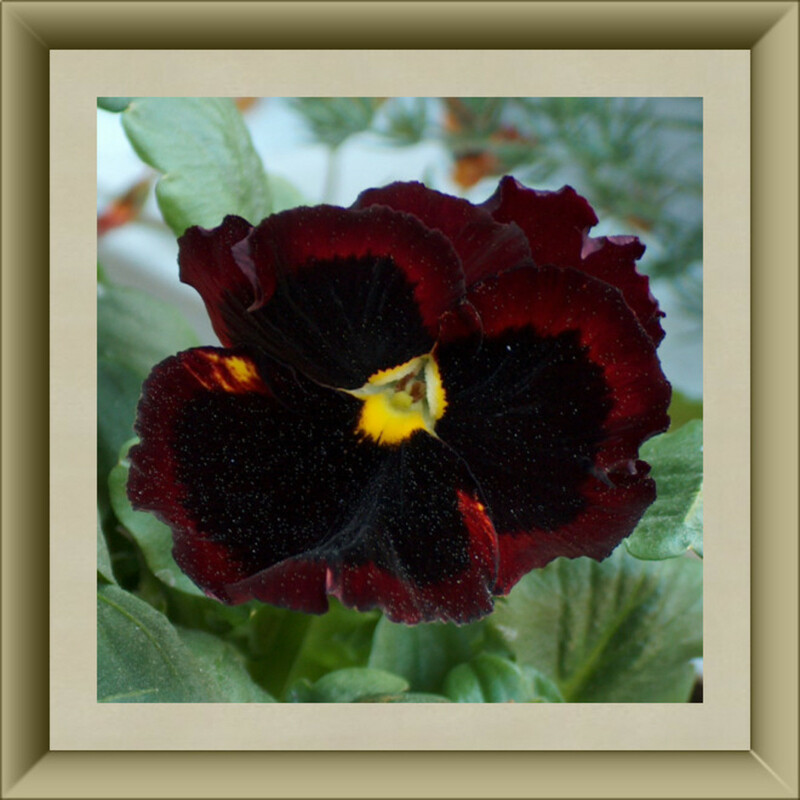 The pansy, is one of my all-time favorite flowers. 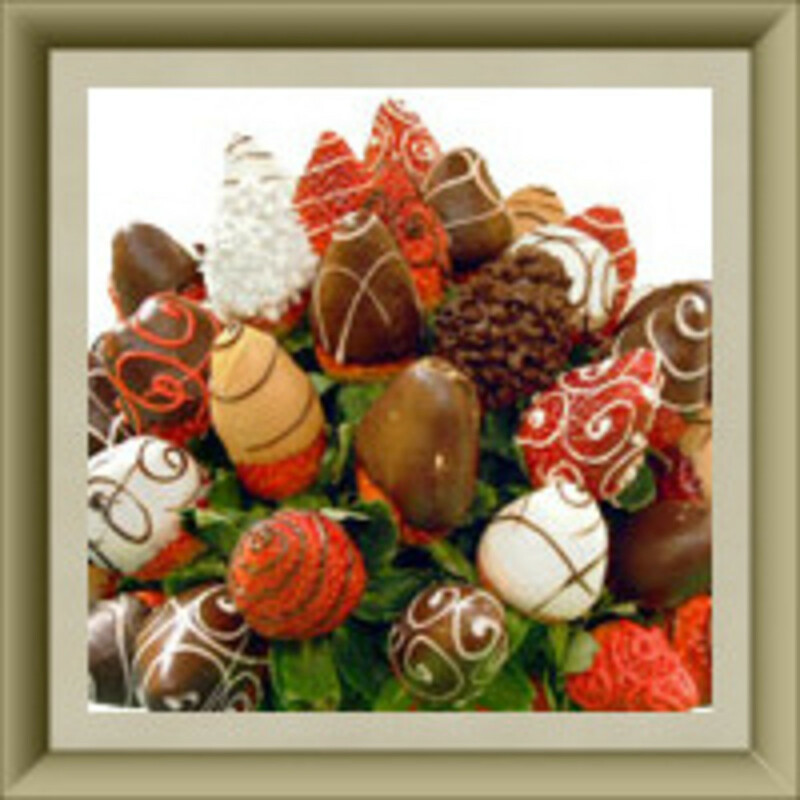 They come in SO many different colors, and contrasting combinations, and all are edible! 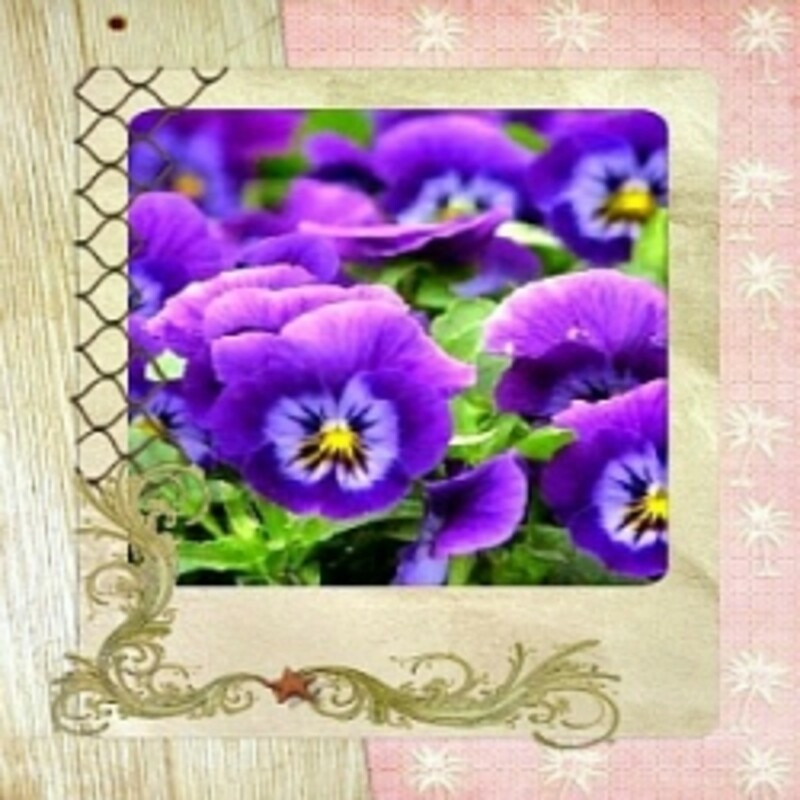 We found recipes for such delicacies as Pansy Melon Salad; Pansy Herb salad; Pansy Popsicles, Spinach Pansy Quiche, and Candied Pansies, Pansy 'N' Chicken Tossed Salad, Pansy-Rotti, a.k.a. Vegan Panzarotti, Wholemeal Red and Yellow Pepper Quiche with Pansies, Lemon Jellyroll with Pansies, and a lot more! 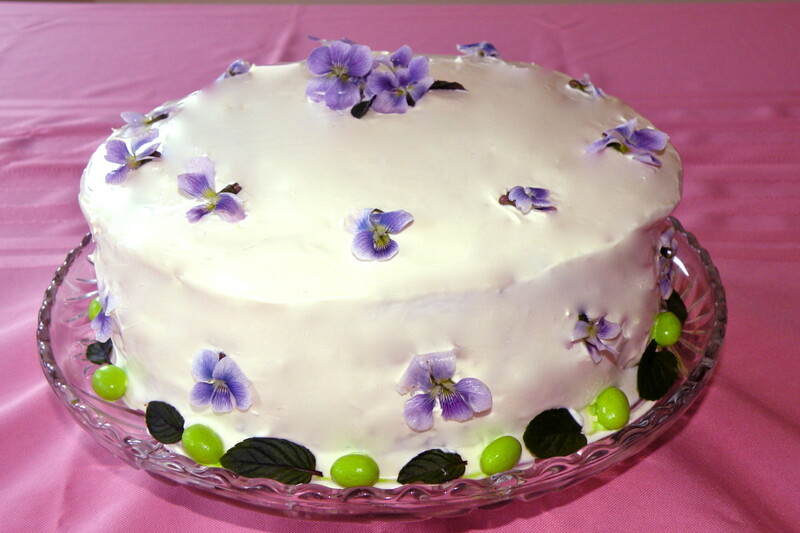 Several creative chefs recommend decorating cakes with pansies, which definitely adds a splash of color and interest. Pansies are a terrific garnish, that can make an otherwise nondescript dish, look like it is fit for a king! 9 - Lilacs - Another Purple Edible! Think about it - there just aren't many vegetables or fruits we eat, that are purple, are there? So, how do you feel about adding lilacs to your food? Lilacs have been used as edible flowers as far back as I can research. Not only do they make a vibrant garnish, but their purple petals are delicious, too! New Hampshire made purple lilacs the official state flower, in 1919, although, in 1991 - pink lady's slipper replaced it. What a shame! The entire species, Syringa is the state flower of Idaho, though - and they haven't replaced it! Lilacs have been used "in the kitchen" for centuries, and there is no lack of advice, as to how to eat lilacs. Since the 17th century, when they first arrived in America, to the present - chefs have used them to make: Lilac Sorbet, Candied Lilacs, Lilac Cream Crepes, Lilac Blossom Yogurt, Lilac Syrup, Panna Cotta with Lilac, Lilac Jelly, Lilac Muffins, and more. 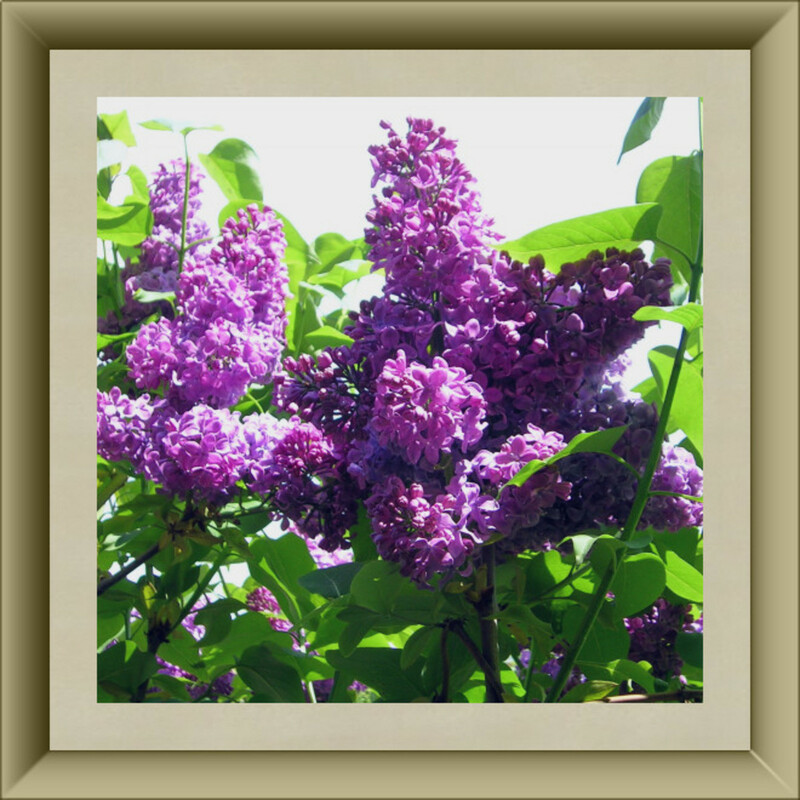 If you live where you can grow lilacs, don't miss out on this incredible taste sensation! 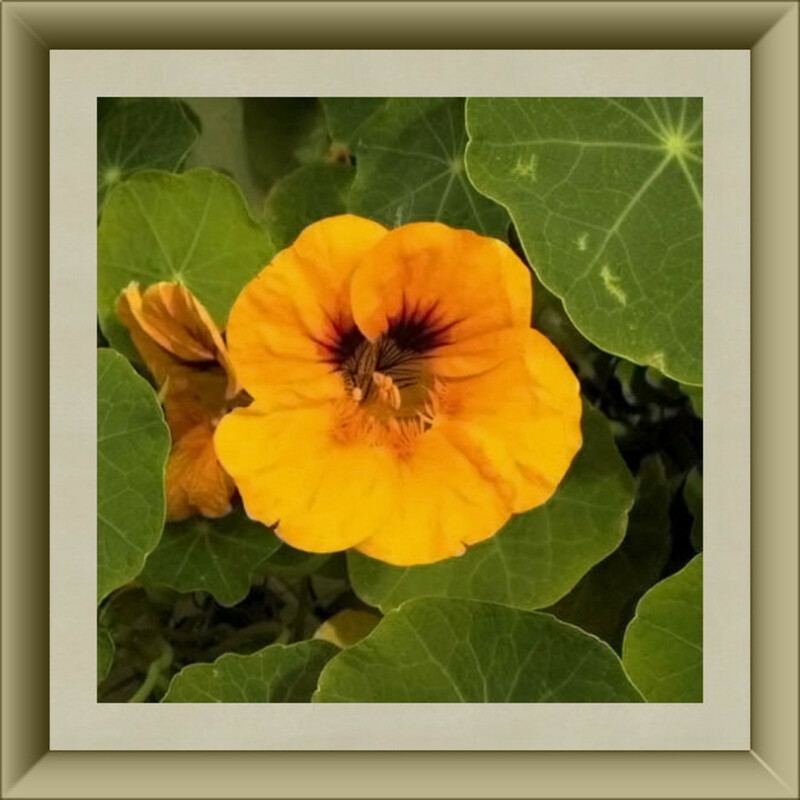 When I was a youngster, in Ohio, we had lots of nasturtiums growing in our yard. Most of them seemed to be "volunteers", and they were plentiful! I knew they were an edible flower, "way back then", and thought that was just one of the neatest things, ever! Of course, my husband says that I am easily amused - and, he's right. Everything in God's creation astounds, awes, and amazes me. Nasturtiums come in so many different varieties and colors, but all of them are edible. 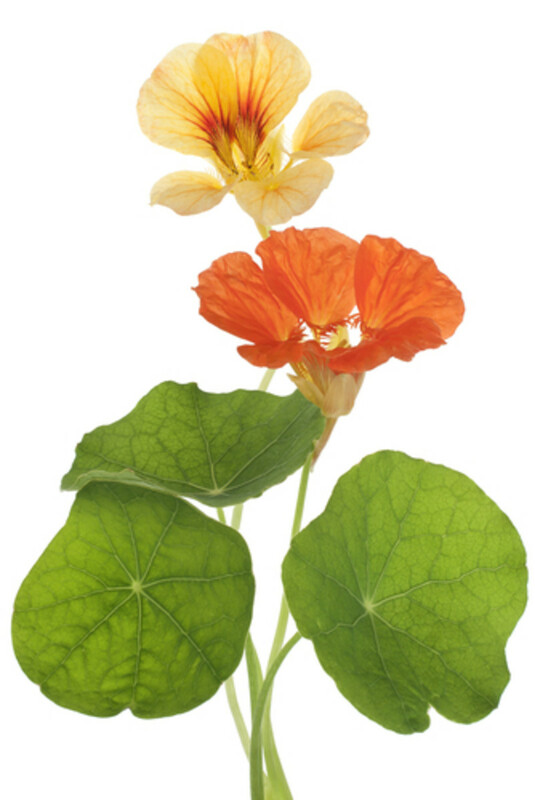 For a crisp, peppery taste, add nasturtium flowers to any salad, wrap, or dip. Some recipes we found, were: Nasturtium Mayonnaise, Nasturtium Lemon Butter, Nikos Nasturtium Soup, Nasturtium Sandwiches, Nasturtium and Grape Salad, and Stuffed Nasturtiums, among many others.. For pasta lovers, they add some lovely color to the dish, and blend well into chili, and spaghetti sauce. Added to pizza, right towards the end, they add a spiciness that is lovely, and are wonderful in one of my all-time favorites - guacamolé. What Do 1 - 10 Taste Like? Nasturtium - peppery and spicy. Everyone's taste buds are different, you know, so yours may detect a completely different taste sensation! Edible Flowers 11-20 are: Hollyhocks, Lavender, Dandelion, Hibiscus, Squash Blossoms, Honeysuckle, Primrose, Bachelor Buttons, Jasmine, and Tulips. Read the "Common Sense Cautions" section, below. Many edible flowers closely resemble other blossoms, which are not edible. As it is with anything else that you ingest - be sure that you know exactly what you are eating! We actually found a reference to Hollyhock and Hybrid Begonia Hot Dogs, Hollyhock Soup, and Hollyhock Salad, but it seems that most chefs prefer to float them atop soup, or use them as showy garnishes. They are not considered to be a first choice, in the long list of various edible flowers. Perhaps one of the reasons, is that some people find them very difficult to grow. For those who get them successfully "up and running", their delight is often short-lived, as squirrels, deer, horses, and rabbits like to eat them! That's what the name means, you know. How many of you eradicate this tasty, nourishing flower from your lawns? Shame on you - eat them! 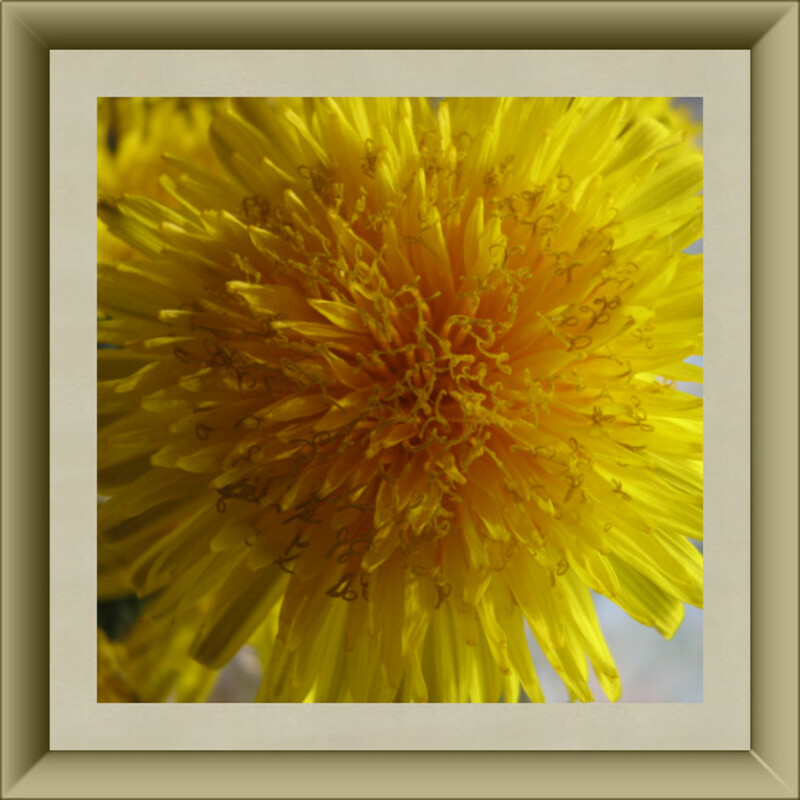 Most people know that you can eat dandelion greens, and make dandelion drinks, but it seems that dandelion's beautiful edible blooms have long gone unnoticed! The tip of my nose used to be yellow, from rubbing the dandelion flowers all over it, but, back then - I never got them a little bit lower - into my mouth! Actually, it's probably a good thing that I didn't, because you are ONLY supposed to eat dandelion flowers, after they have been cooked! Nevertheless, many Oriental restaurants garnish rice with the raw petals, and we have found recipes using dandelions, such as: Dandelion Salad, Dandelion Soup, Dandelion Egg Salad, Dandelion "Mushrooms", Cream of Dandelion Soup, Pumpkin-Dandelion Soup, Split Pea-Dandelion Bud Soup, Potatoes and Dandelions, Sautéed Dandelion Blossoms, Dandelion Potato Gratin, and Chicken and Dandelion Soup. Not only are lavender blossoms one of the most fragrant flowers around, but they are delightfully tasty, when added to your food. So many dishes that are standard fare, just look dull and drab. Lavender flowers are one way to dramatically change that! Fancy by nature, they add an elegant look to any meal, and nutrition - to boot! 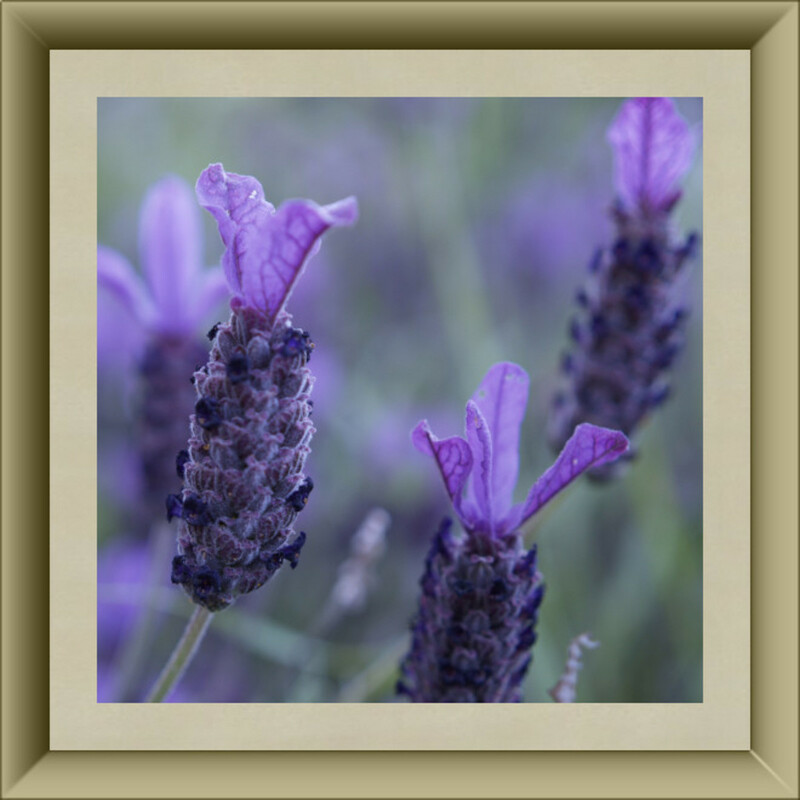 We found quite a few intriguing recipes using lavender. How do these sound? Blueberry Lavender Cranberry Crisp, Lavender Mini Meatballs, Lavender Syrup, Lavender Sauce, Lavender Ice Cream, Lavender Blossom Yogurt, Lavender Banana Smoothie, Lavender Tea Cookies, Tangerine-Lavender Sorbet, Tomato Lavender Jam, Almond Lemon Lavender Biscotti, Grilled Pork Chops with Lavender Flowers, Lavender Creme Brulee, Lavender Custard, Lavender Jelly, Lavender Focaccia, Lavender Hazelnut Bread, Peppered Lavender Beef, and Lavender Shortbread. The possibilities are endless! One US state - Hawaii, and two countries - South Korea and Malaysia, claim the hibiscus as their official flower. 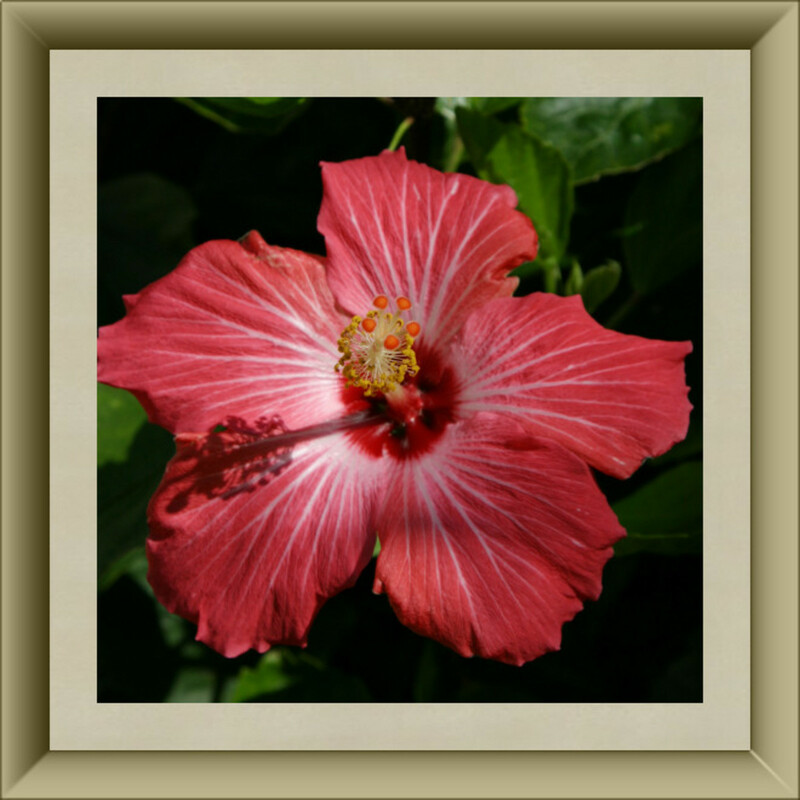 Where I live, these flowers grow abundantly, and I think that hibiscus flowers are one of the tastiest flowers you can eat. Most people know that you can use hibiscus petals to make rosy-hued hibiscus tea, but they are unaware that the blossoms are edible, too! I like to eat the hibiscus flower buds, before they open, right off the bush. Most people are familiar with Hibiscus Tea, which is marvelous by the way, but people eat hibiscus buds and flowers in many other ways, too. Take a look at some of the dishes we found, that are made with hibiscus: Spiced Jamaica Hibiscus, Sautéed Hibiscus Pods, Hibiscus-Marinated Leg of Lamb, African Hibiscus Punch, Adobo Beef Salad with Apricot, Ginger and Hibiscus Salsa, Hibiscus Fruit Salad and Seared Duck Breast With Hibiscus Flowers. 15 - Squash Blossoms - Better Than Squash! This one, I learned about from my husband. His mother used to fry up squash blossoms, and he said they were wonderful! I had no idea that they were edible. When I was a young child, I dreaded the "mushy" squash that my mother used to cook. It was awful! I wish she knew about squash blossoms - those, I'd have loved! As an adult, I learned to eat my squash raw. That is really good, and my husband makes fried squash chips, which are tasty, but I still don't care for it "mushy". However, the squash blossoms are great! 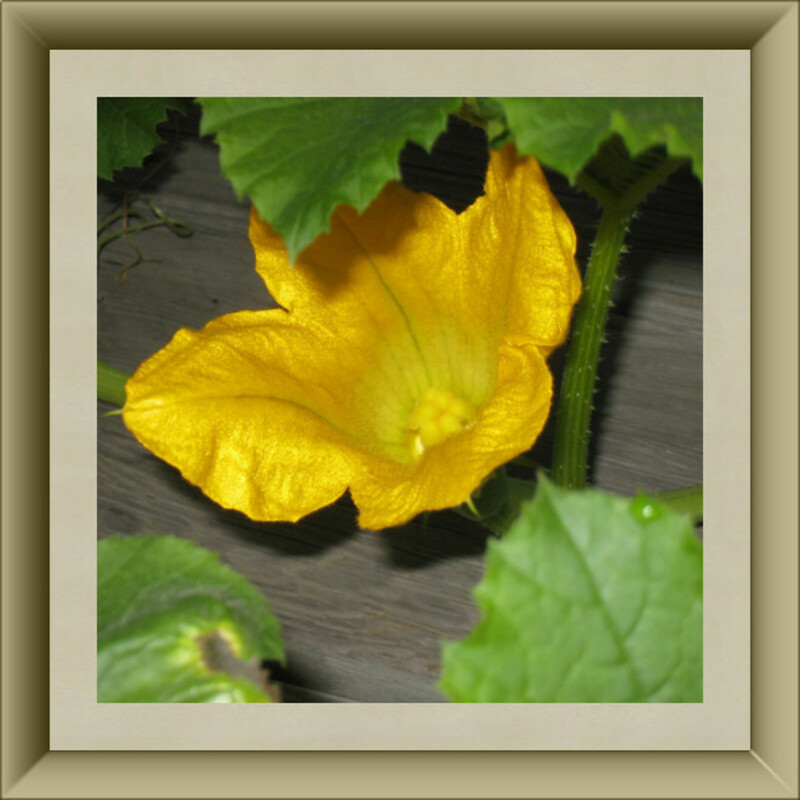 Now, don't turn a deaf ear, here, just because you don't like cooked squash - I'll bet you will love squash blossoms! You don't think so? Well, how about: Squash Blossom Rice, Squash Blossom Frittata with Asiago Cheese, Fried Squash Blossoms, Squash Blossom Fritters, Stuffed Squash Blossoms, Squash Blossom Soup, Squash Blossom Quesadillas...do I have your attention, yet? 16 - Honeysuckle - Not Only For The Bees! Who hasn't sucked the sweet, honey-like nectar from honeysuckle blossoms? What a delightful taste! Did anyone ever tell you, though, that you can actually eat the honeysuckle flowers? Growing up, I was only familiar with the white honeysuckle blossoms; I didn't know they bloomed in any other color. Then I discovered that honeysuckle plants bloom in a variety of colors. Look at this incredible image, from Luc Viatour. Check out his photography, in the Photo credits, at the end of the article. Some savvy cooks use honeysuckle flowers to make: Honeysuckle Sorbet, Witch Bread - Clairnova with crushed, dried honeysuckle flowers, Honeysuckle Ice Cream, and Honeysuckle Jelly. Interesting, no? 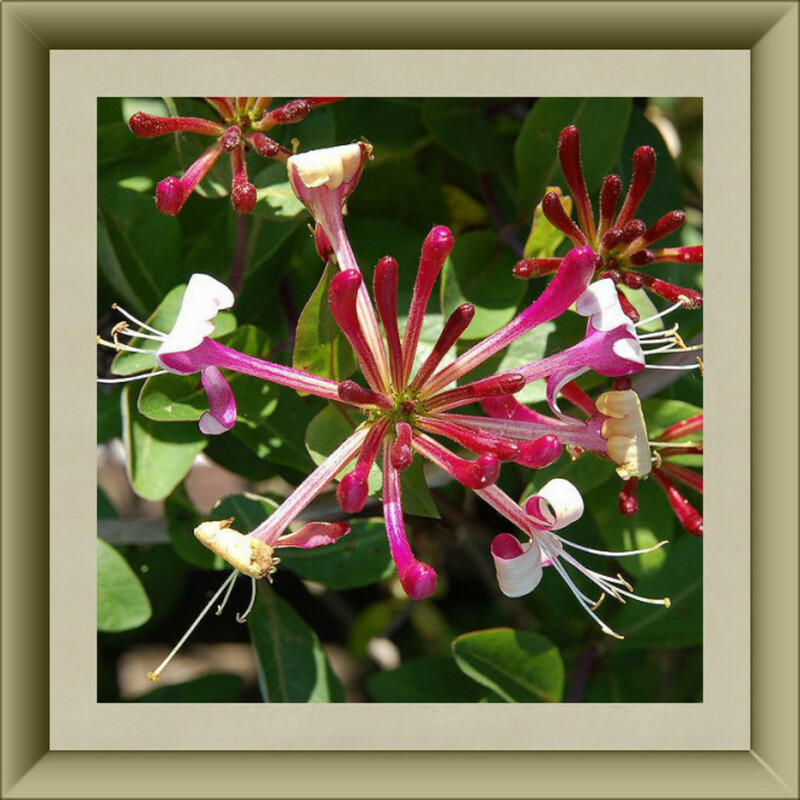 If you are fortunate enough to have honeysuckles growing in your area, experiment with some sweet recipes of your own - just watch out for the bees! Tradition says that primroses are the first flowers to bloom in the spring. I'll bet that you didn't know you could eat the flowers, though - did you? Well, you can, and this is NOT a recent discovery, either! People have been eating primroses for centuries. Some people call primroses "cowslip", but they are not really the same flower. Some of the recipes we found, for eating primroses, are: Primrose Pudding, Candied Primroses, Lattice Topped Parsnip and Primrose Pie, Primrose and Elderflower Stuffed Pork with a Tangerine Sauce, and Primrose Vinegar. There are lots, lots more, especially in vintage cookbooks. Who would think you could eat primroses? Folklore says - if you eat them - you'll be able to see the fairies! Wait until one of my daughters hears that! She'll be eating primroses the same day I tell her about it! She just loves fairies! In addition, we read somewhere that eating primroses, is supposed to be good for your skin - so I can just see a lot of folks "walking down the primrose lane" to get their primrose facial! Don't you love that gorgeous blue? Now, wouldn't THAT look lovely on a dinner plate? 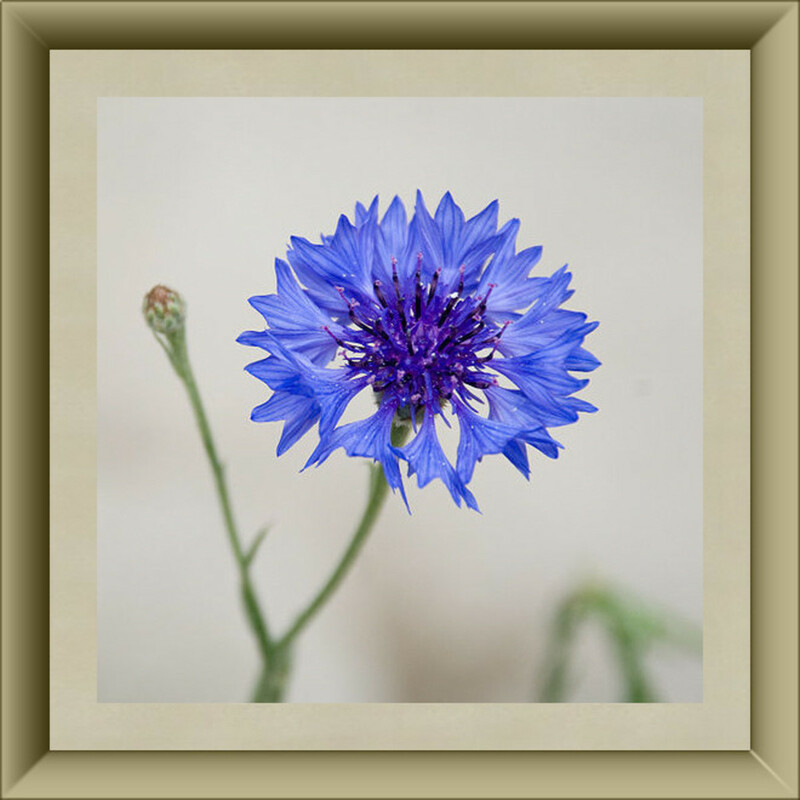 As much as I drank in the beautiful hue of cornflowers, which I always called bachelor buttons, I never dreamed you could EAT them - but, lo and behold - you can! For salads, they are great, as their brilliant blue hue contrasts wonderfully with salad greens. Blue is usually a hard color to find, in edibles. Just imagine a "Fourth of July" salad, with greens, white onions, red sweet peppers, and bachelor buttons! What a feast for the eyes THAT would be! Recipes using Bachelor Buttons are not very easy to find. We "ferreted out" just a few: Violet Meringues with Cornflowers and Blueberry Mousse, Bachelor Buttons Cookies, Cornflower Soup, and Bachelor Buttons Salad. Who could ignore, and not adore the unmistakable smell of jasmine? Once you have experienced it, you will never forget it. The fragrance is intoxicating, to say the least! Well, guess what? You can not only appreciate jasmine for it's incredible aroma, you can also eat the lovely blossoms. Didn't know that, did you? No, neither did I, for most of my adult life. 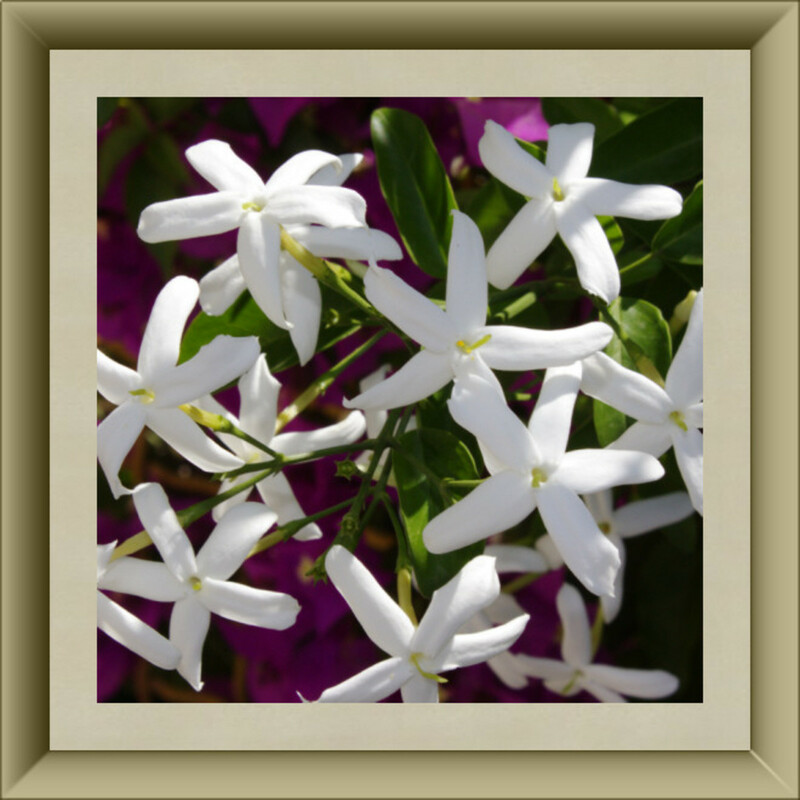 Be certain that you are eating Jasminum sambac - all other jasmine species are poisonous! There are recipes galore for Jasmine Rice, which is the actual brand name for a variety of rice, and Jasmine Tea, and Jasmine Water, but there are few to be found for Jasmine blossoms in entrées, spreads, dips, butters, salads, etc. I KNOW they are out there, but they're hiding successfully from me, so any jasmine flower recipes are welcome! Originally, these blooming beauties came from Persia - what we now call Iran. Did you know that? Every time I think of tulips, I remember seeing a vast, lovely field of them growing, when I was traveling through the state of Washington, many years ago. The sight was magnificent to behold. Little did I realize then, that tulips are an edible flower. You can REALLY dress up a dish with tulips, because they grow in so many different colors, sizes, and shapes. The variegated ones are very "fancy", and can intrigue of color to an otherwise "lackluster" entrée. There are quite a few recipes for using tulips in "kitchen cuisine", but in some people, they elicit an allergic reaction. Try just a few petals, until you know if you are able to tolerate them. Tulip petals are very effectively used as a "cradle" for nuts or hors d'oeuvres, as toppings, as decorations on cakes, pies, puddings, yogurt, or as a floating garnish for any soup or stew. What Do 11 - 20 Taste Like? 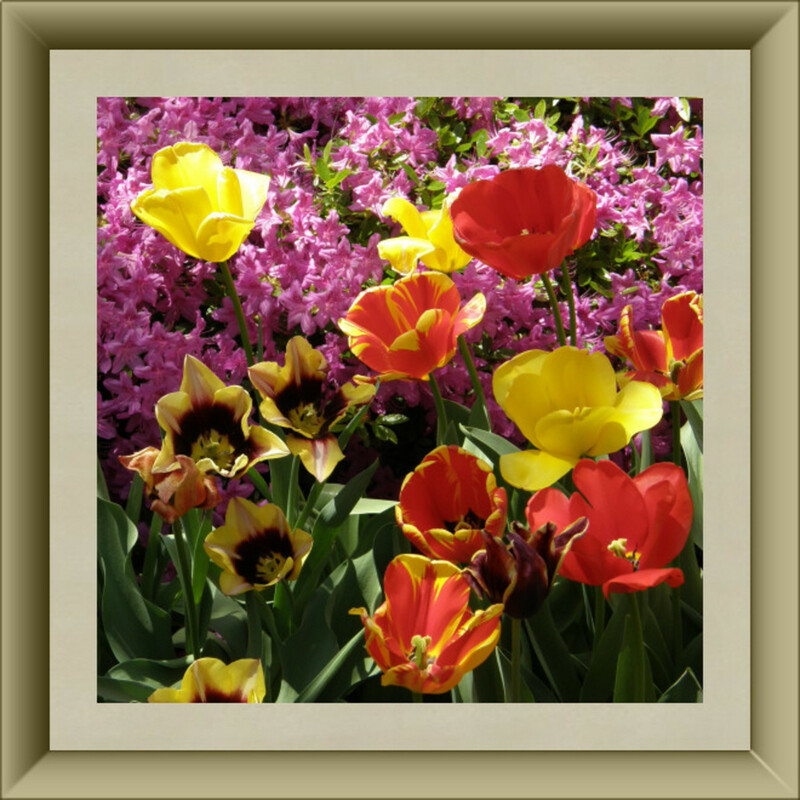 Tulips - crisp and sweet, like peas. Edible Flowers 21-30 are: Chrysanthemums, English Daisy, Chives, Lemon Blossoms, Marigolds, Sweet William, Garlic, Snapdragons, Calendula, Chicory. Ah, this gal is "right up my alley"! She has compiled a delightful book, with creative ideas on how to effectively add edible flowers to your family's food. I own this book, and love it! The chrysanthemum has been a cultivated flower, for thousands of years - prized for its beauty and valuable properties. Did you know that the Imperial seal of Japan, displays a chrysanthemum? The chrysanthemum flower motif is still to be found just about everywhere you look in Japan - on their currency, on their passports, decorating their furniture, in their restaurants, in their artwork, and on their buildings. I understand that chrysanthemum flowers are edible, but many people find them to be very bitter. Now that I think about it, I have yet to hear one person actually call them "scrumptious"! Affectionately called "mums", their dried petals are often sprinkled over main dishes, or added to dips, salad dressings, or spice blends. In the Orient, many different traditional ethnic recipes utilize chrysanthemums, however we found quite a few that were not from the Orient, such as: Chrysanthemum Stir Fry, Roast Chicken Noodle Soup with Chrysanthemum, Lobster with Chrysanthemum, Tofu and Beech Mushrooms, Sweet Potatoes with Sautéed Chrysanthemum Petals, Lobster and Crab Chrysanthemum Leaf Salad, Chicken with Chrysanthemum Petal Sauce, Chrysanthemum Soup and Chrysanthemum Ginseng Wolfberry Jelly with Raw Honey. Well, have I whet your appetite yet? Do you remember Please Don't Eat the Daisies", that hilarious movie from the 1960, starring David Niven and Doris Day? Well, you can eat the daisies! 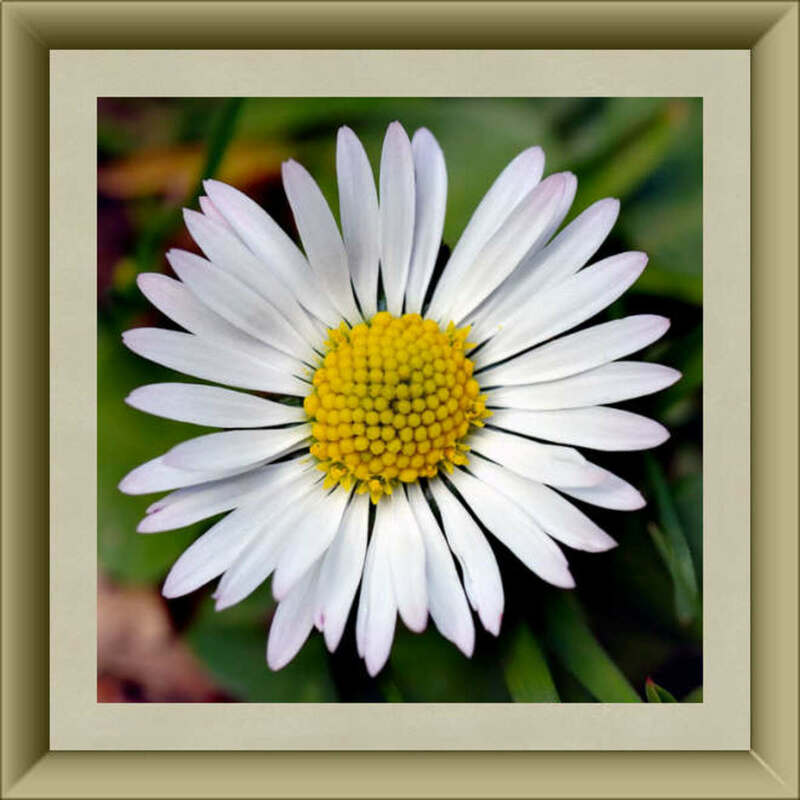 The variety most often referred to as the edible flower, English Daisy, is this one - Bellis perennis. I have picked so many daisies, and watched them wilt in vases filled with water...when I could have added them to my cuisine! English Daisies grow prolifically; some people view them as weeds. Personally, I think they are cute; representative of a child's idea of a flower. Whether you use only the petals, or the entire flower - daises make great garnishes, for almost about any dish. Just as it is with cilantro, a.k.a. coriander - opinions on the taste of English Daisies are vastly varied. Some folks simply love them, and some folks cannot stand them! Nevertheless, they have been a constant on the time-honored list of acceptable edibles, for centuries. Delicate, savory, lavender-hued chive blossoms are simply wonderful in salads, soups, omelettes, with cheese and as garnishes. We grow our own! If you have never experienced their marvelous flavor, you might like to check out some of the ideas that we found on: Serious Eats. There are references for using chive blossoms in some very unusual ways, such as - Chive Flower Oil, Gnocchi with Chive Flowers , Chive Blossom Broad Beans, Curried Yam Salad with Chive Flowers, an inherited dish of Stir-Fry Chive Flowers with Pork and Oyster Sauce, and more. 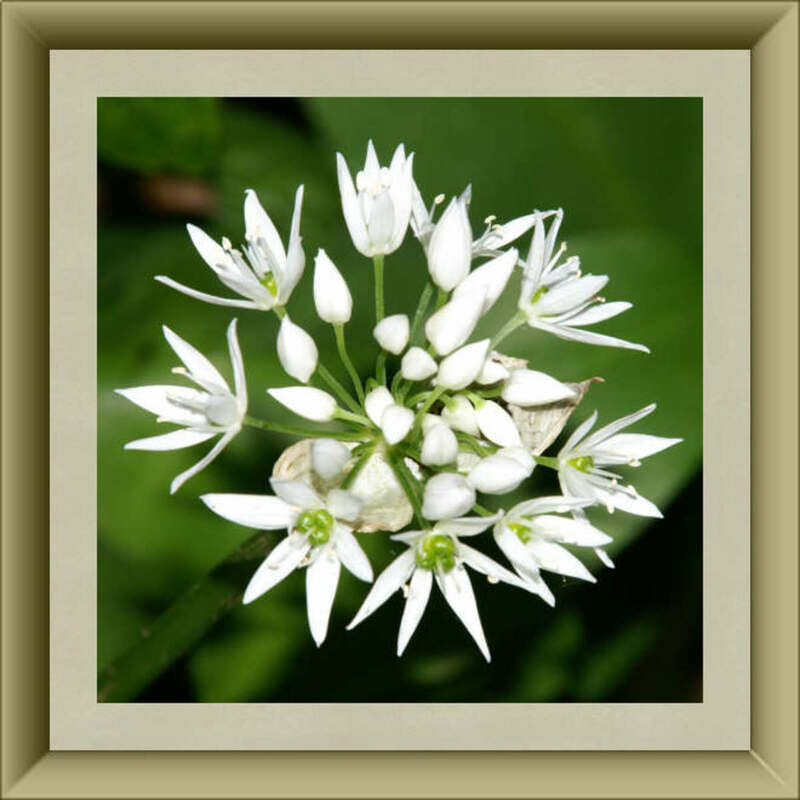 How about: Chinese Chive Flowers with Shrimp, or a Kale, Apple and Chive Flower Salad that was featured on Oprah Winfrey's show, or Elegant Omelette Gateau with Chive Flowers, or Chive Blossom Tabbouleh? There are so many ways to eat these delightful blooms - yet most of us only eat the chive leaves. It is time to break with tradition, get creative, and start using the blossoms! 24 - Lemon Blossoms - Better Than A Lemon! Goodness! Just the smell of lemon blossoms is good enough to eat - if you could eat a smell, that is! When a lemon tree is in bloom, it's fragrance is unmistakable, and unforgettable. Traditionally, lemon blossoms stand for "discretion". Well, there is nothing discrete about their strong, attractive aroma! People from many different cultures, all over the world, eat lemon blossoms. To mention a few lemon blossom recipes we found, here are: Lemon Blossom Preserves, Lemon Blossom Sorbet, Lemon Blossom Ice Cream, Lemon Blossom Petal Syrup, Orange and Lemon Blossom Spoon Sweets, Lemon Blossom Yogurt, and of course, Candied Lemon Blossoms. Whenever I see a word containing the letters "g-o-l-d", it catches my eye - due to the industry I have been in for many years. It isn't growing flowers, either; that's my husband's expertise. He grows orchids. As an aspiring gardener, in my twenties, I was delighted to discover that I could successfully grow marigolds! Most of the potted flowers that I brought home, just "up-and-died" when I pulled up in front of our house. They KNEW the fate of those before them, and just "gave up the ghost" - right on the spot. They are such an interesting flower - their spicy petals are used extensively in edible flower circles. I found recipes for: Marigold Buns, Venison with Marigolds, Spicy Marigold Rice, Mushroom Salad with "Lemon Gem" Marigolds, Marigold Cheese Soup, Marigold Potato Puffs, Marigold and Dandelion Eggs, Marigold Omelette, Beef and Marigolds, Monkfish Pasta with Marigolds and Anchusa - and a LOT more! 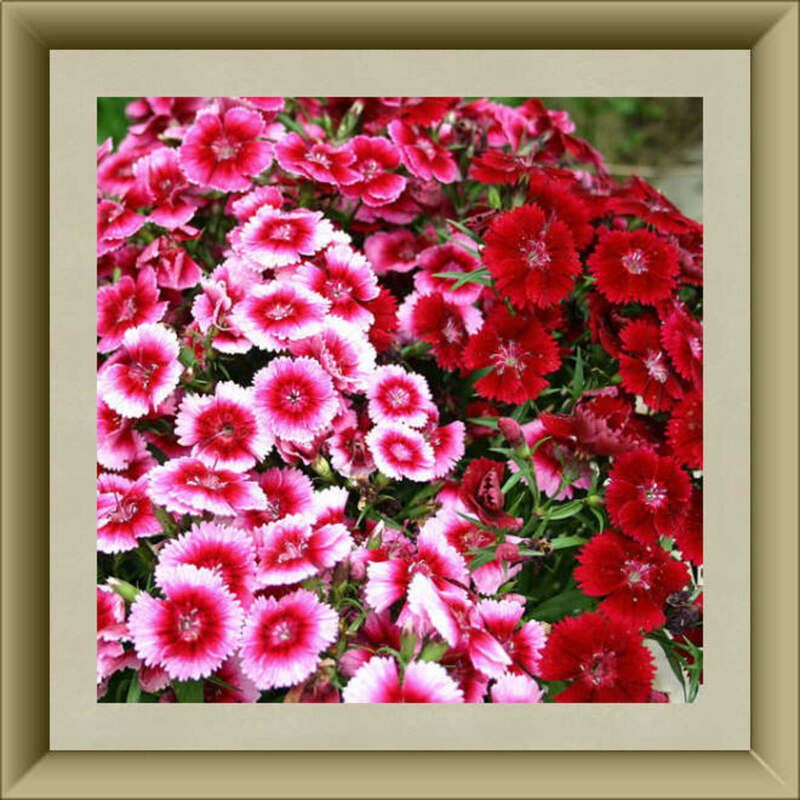 Sweet William is actually a common name for a particular variety of Dianthus - another adorable edible flower. It is too "cute" to be called "gorgeous", but it can add a lot of color to your dinner table, and I don't mean as a centerpiece! Add Sweet William blossoms to brighten up cream soups, to spruce up salads, to add color to salad dressings, and to decorate cakes, and ice cream dishes. They have a way of bringing a smile to your countenance, with their "pepperminty-looking" little "faces". In order to avoid any bitterness, when eating Sweet William flowers, only the petals should be eaten. The white base in the center, where the petals are attached to the flower, is bitter. Its botanical name is Dianthus barbatus, and it is commonly grown in almost every area of the North American continent. At a café my late husband and I used to frequent, they called us - "Mr. and Mrs. Garlic" - because I always brought fresh garlic cloves along, to cut up and mix into our food. In my lifetime, I have consumed hundreds of garlic bulbs, but, until recently - I did not know that the garlic blossoms were edible! I even spent an entire year, researching the properties of garlic, and have touted its health benefits to thousands, without knowing that you could eat the garlic flowers. How I missed this one, is beyond me, because I love garlic! We found quite a lot of information online about innovative ways to use the flowers of garlic in your cooking. Since I am a garlic enthusiast, I'll add some of my ideas! I have made Garlic Pizza, Garlic Apple Compote, Wilted Garlic Salad, Garlic Chive Cheese Omelettes, and a whole lot more! 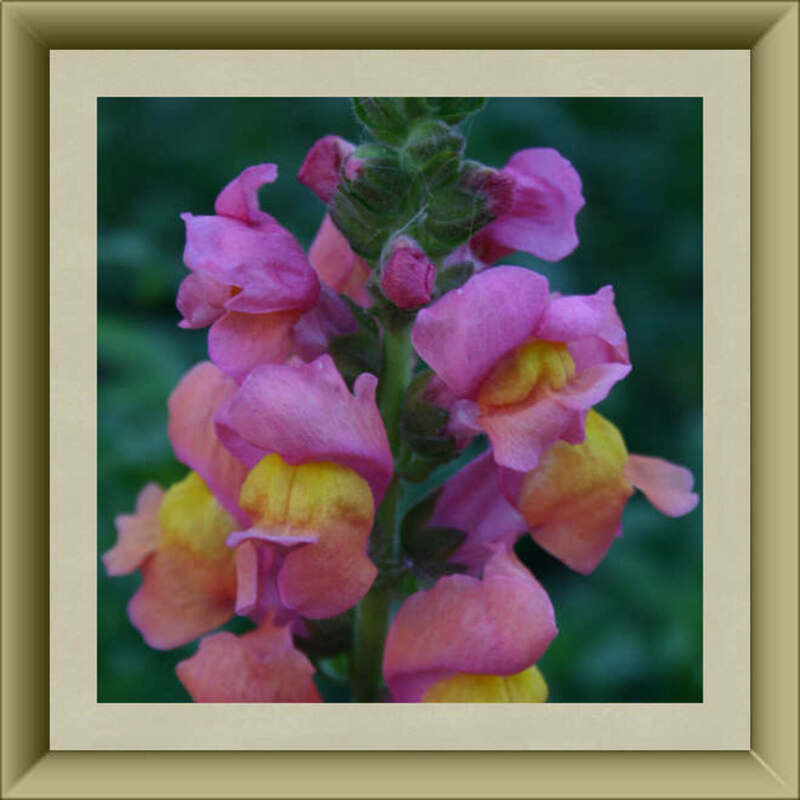 28 - Snapdragons - What A Name! Snapdragons! I just loved them, from the first time I saw their blooms almost 40 years ago, and what child could resist a flower by that name? How did snapdragons come by their unique name? Well, supposedly the reason is because the flower resembles the face of a dragon, and it "opens" when you press on it, from its sides. That's the story, anyway. I always thought it was because they snapped at dragons, but - what do I know? Apparently, most edible flower chefs use snapdragons primarily for garnishes, but we did find a few unusual ideas. For your culinary delight, try some of these ideas we found, from such varied sources as American homemakers to Asian chefs: Snapdragon Ice Cubes, Snapdragons in Jello, Citrus-Spiked Snapdragon Jam, Snapdragon Salad, and Snapdragons in Applesauce with Raisins. This rather gentle, mild bloom packs an incredible nutritional punch! 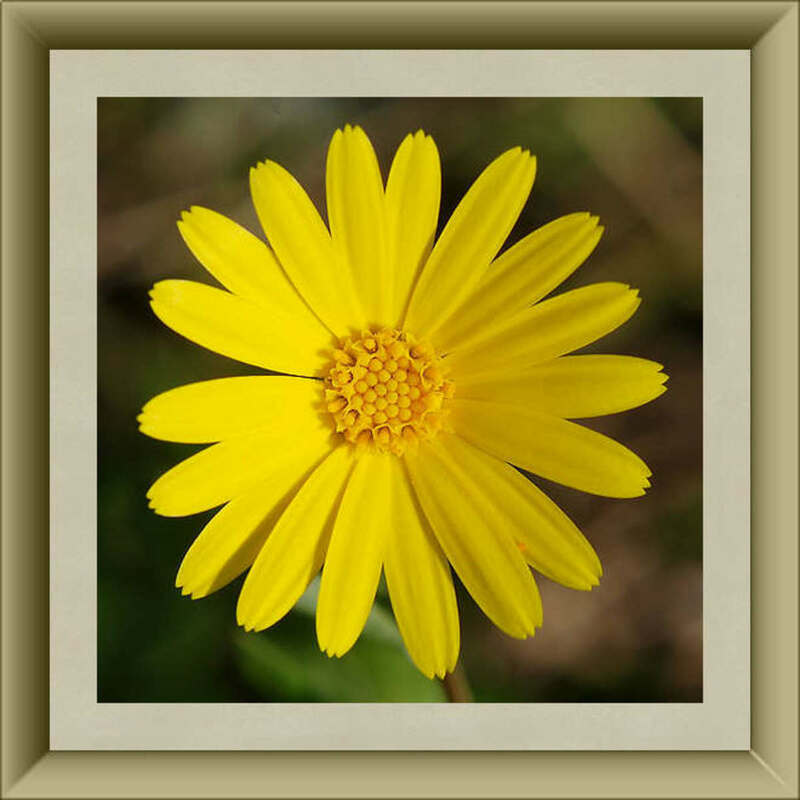 Calendula has been prized for its medicinal properties by herbalists for thousands of years, all over the globe. You might wish to start your edible flower garden with this one, as it is reputed to be a "breeze" to grow. On the other hand, it doesn't get the rave reviews some of them get, when it comes to taste. The calendula petals lend themselves well to drying, and have been used extensively to impart a lovely yellow color to herb butters, and dips. We didn't find a plethora of ideas for cooking with calendula flowers, but here are a few: Golden Corn Bread with Calendula Petals, Calendula Flower Spinach Omelette, Calendula Biscuits, and Calendula Herb Butter. The fresh petals pack a lot of eye appeal, sprinkled over chicken dishes, rice pilaf, or beef stew - and - the dried petals are very dramatic, added to soups, salads, dressings, cakes, and sweet breads. Use your imagination! One of my favorite coffee substitutes, chicory, is not only lovely - the plant's uses appear to have no end. 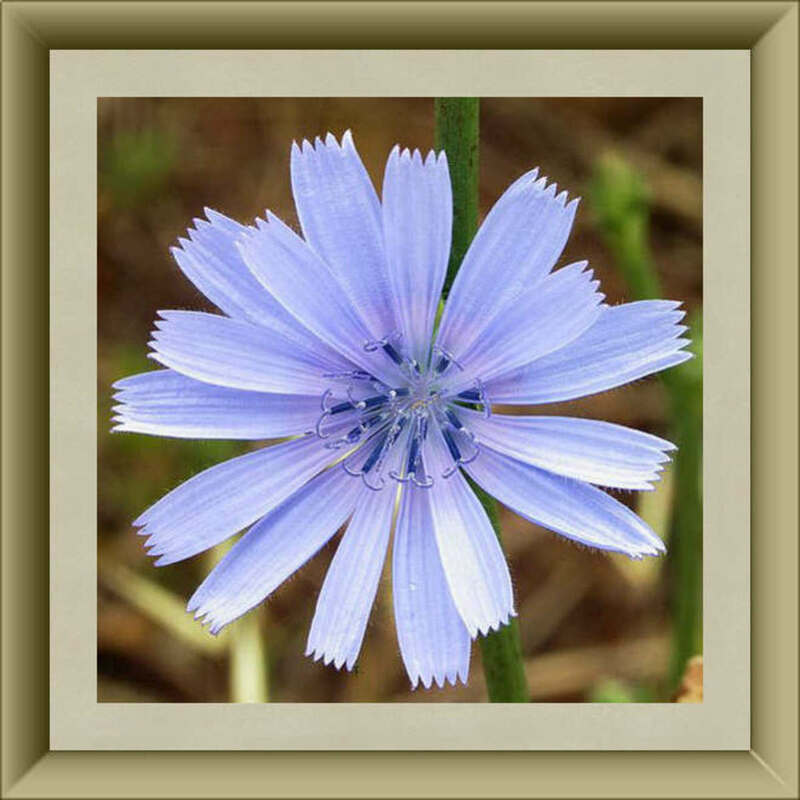 Even in ancient times, chicory was a prized plant, referred to by the famous Romans - Pliny the Elder, and Horace. 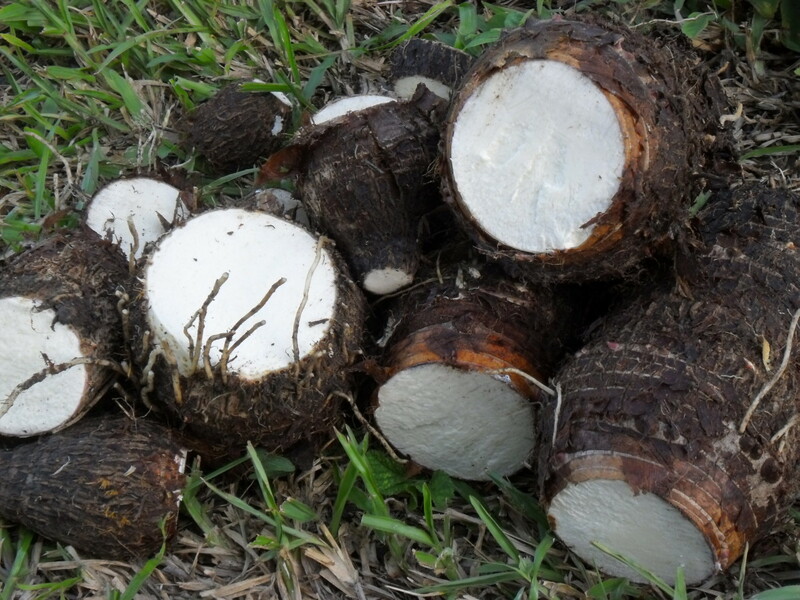 Currently, it is valued for its medicinal qualities, planted for animal fodder, and also used in making various aged beverages. According to the USDA, chicory grows freely in all of the states in the US, with the exception of Hawaii and Alaska. It is also grown in many other countries, as is attested to, by the writings of the ancients. Chicory blossoms are usually the color of those in the photo, but they can be found in a variety of hues - from cornflower blue to light lavender, or even white. The buds are commonly pickled, and the chicory blossoms are used in such varied dishes as: Chicory Flowers with Roquefort dressing, Chicory, Crystallized Chicory Flowers, Pickled Chicory Flowers, and Chicory Flowers Pasta. Last, but by no means least, we found a unique dish that's served at a fine restaurant in the UK, entitled - Rose of Goat Cheese Mousse with Ciabatta, Chicory Petals and Pink Peppercorn Dressing. What Do 21 - 30 Taste Like? 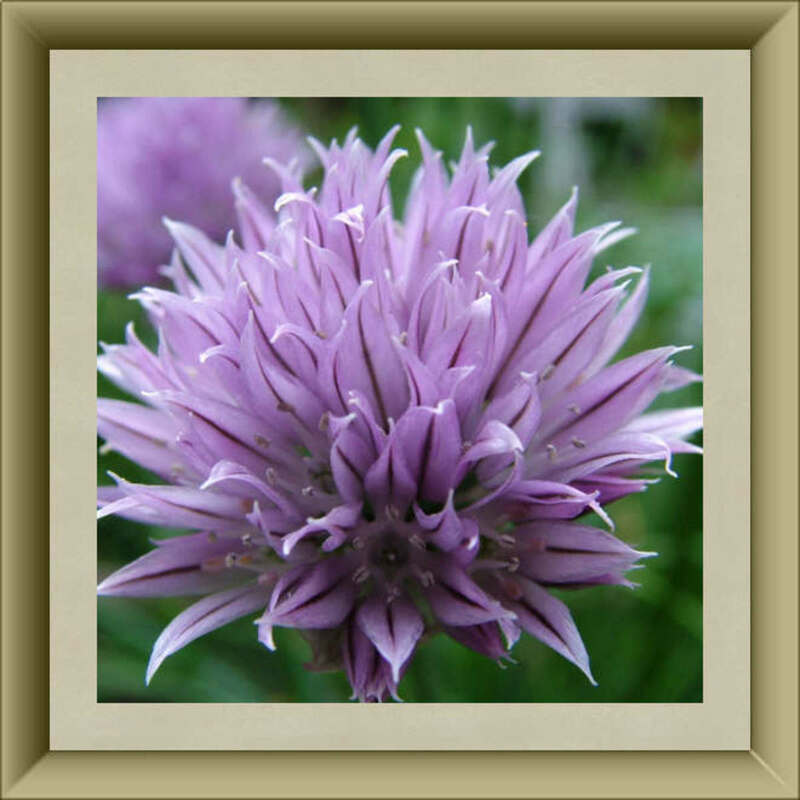 Chives - like chive shoots; "oniony"
Marigolds - spicy; clove-like, or "grassy"
Edible Flowers 31-40 are: Coriander, Bee Balm, Dill, Rosemary, Sunflowers, Basil, Pineapple Sage, Cattails, Gladiolas, Chamomile. Flowers ARE good enough to eat! Frankly, it is hard to describe this book - the title says it all! The author has done a marvelous job of introducing edible flowers to the table, with alluring photographs to arouse the palate of any cook, and instructions for how to grow them, too. P.S. I will leaving the "growing" part up to my husband, as he is the one in the family with the green thumb! Personally, I detest cilantro, in any form. My taste buds say that it tastes like soap - Dial soap. What? Did I hear someone ask how I would know what Dial soap tastes like? Oh, I eat it sometimes, when I have nothing else better to do. No,... that's just not true. My mother liked to administer a dose of it on my tongue, if she even thought I might possibly have sassed her. She was quick with the Dial soap. I cannot imagine what she would have done, if I ever used a bad word - which I never did. She would probably have forced me to eat a whole bar of Fels-Naptha soap, or something worse! I am seriously considering "divorcing" my oldest son and his dearly beloved wife, because of the rhapsodies they go into, about cilantro! No, couldn't do that - I love them both too much. So much for "inherited" tastes! For your culinary pleasure, I forced myself to find some recipes using cilantro flowers. I am only doing this, because I know how healthy they are to ingest, and millions of people love cilantro. So, here is what I found: cilantro flowers can be used in any recipe that calls for cilantro leaves. The flowers are used in salsa, guacamolé, salads, soups, omelets, cilantro butter, and just about anything else you can concoct using cilantro leaves. So, the "gist of it" is, that coriander a.k.a. 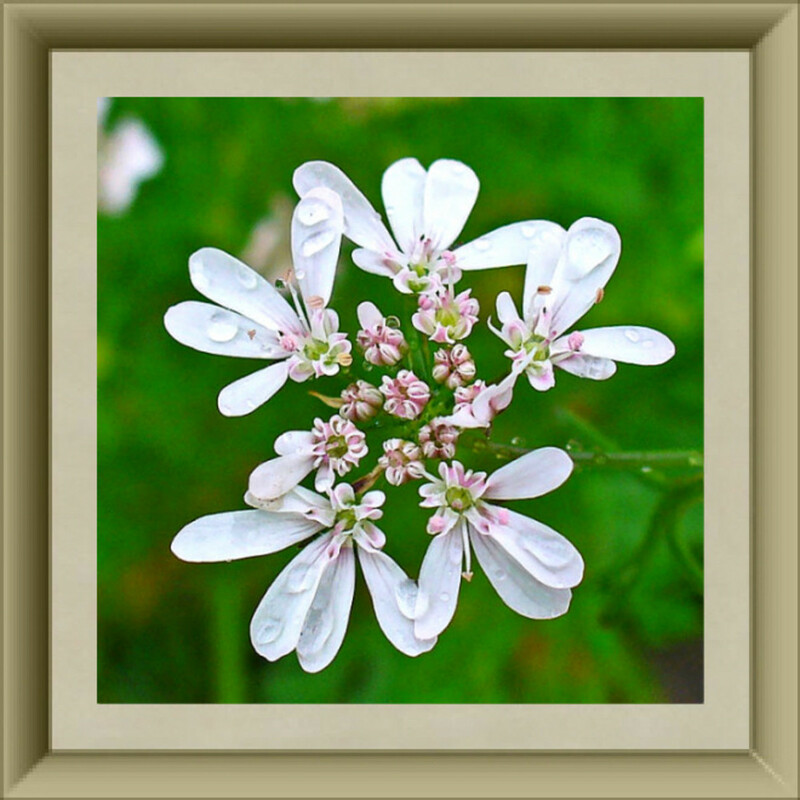 cilantro, flowers, are edible, even though I don't think they are fit to eat! 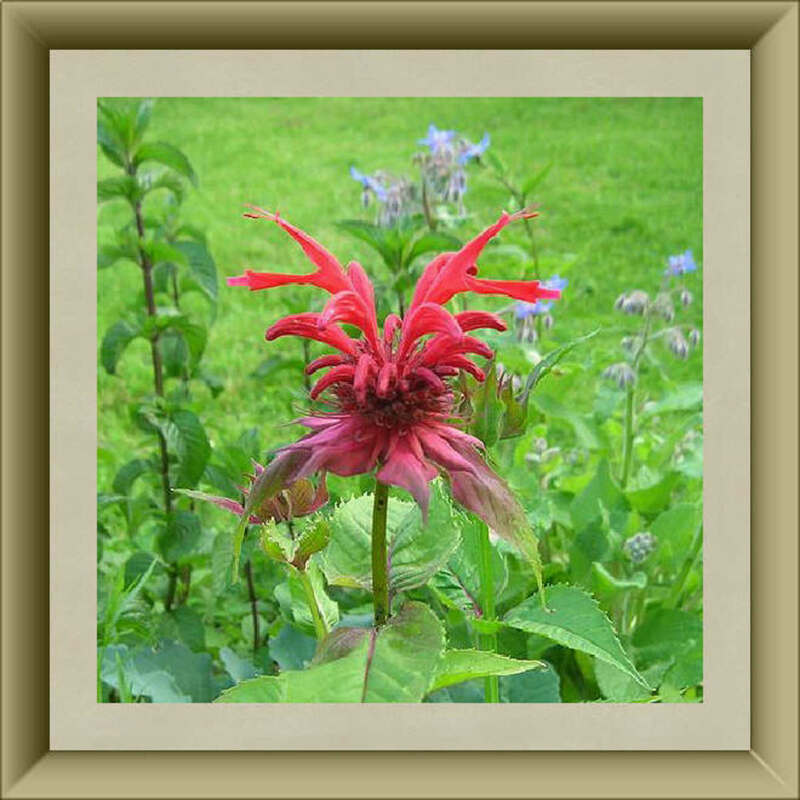 How does THIS botanical name roll off your tongue - Monarda didyma? Try it - it sounds "weird". What a strange name, for such a beautiful blossom. We found a few recipes online, using bee balm blossoms. One of them bears quite an interesting name - Hummingbird Bread. Doesn't that sound, well...interesting? In addition, we discovered that bee balm blossoms are a marvelous compliment to any seafood dish, but they are also used in fruit salad, in curries, with beef, pork, chicken, duck, rice, and added to, or floated in citrus punch. The flowers can be frozen successfully, and will keep well for a couple of months, retaining all of their flavor. They make a great addition to any homemade teas, tossed salads, and are a striking garnish for any entrée! 33 - Dill - My Favorite "Weed"
When we lived in Ohio, we used to have quite a bit of dill planted right outside of our back door. My mother used to send me out there, to cut off some dill flowers, called "heads", to put into our food. She used them to make something she called "placintas". My godmother, who was from Romania, taught her how to do it. Technically, the word "placinta", in Romania, just means "pie". There, they are made with phyllo dough, and filled with a veritable smorgasbord of different fresh ingredients. Typical of my mother, she made her Dill Placintas with eggs, flour, milk, dill blossoms, and Swiss cheese, but no phyllo dough. I don't think she even made any in the last 40 years, but I can still remember how good they were, like it was yesterday! As a youngster, I cannot remember ever eating any part of the plant, other than the dill flowers. They were SO good! Now that I am grown, I eat dill all of the time, planted by my husband. Dill heads are commonly used in sauces, with fish, in omelettes, and of course - in homemade dill PICKLES! As much rosemary as I eat...you'd think that I would have eaten the blossoms! Did you know that the herb supposedly signifies "remembrance"? Well, if that's true, you'd think I would remember, but, I didn't! Oh, well...better late than never, I guess. One of the most interesting things I have ever read about rosemary, I saw on The Epicentre. It was, that a vigorously growing rosemary bush is an indication that a woman rules the household. Well, it's a miracle that my husband and I have any rosemary, then - because I don't need to be in charge at home. I have been in charge of my businesses, for years, and it's not all that it's "cracked up" to be! 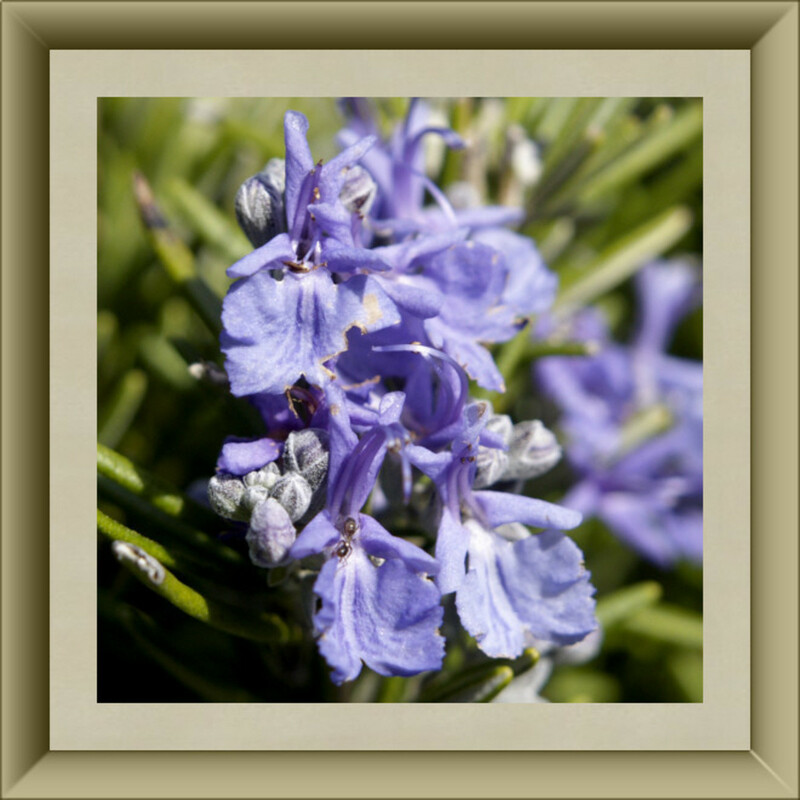 Want some ideas for using rosemary flowers in your cooking? Well, we found some, that piqued our interest, such as: Lemon Rosemary Chicken, Rosemary Homemade Potato Chips, Fresh Berry and Rosemary Fool, Rosemary Flower Stew, Spinach and Rosemary Soup, and Rice and Rosemary Blossom Salad. Eat sunflower seeds? Of course! 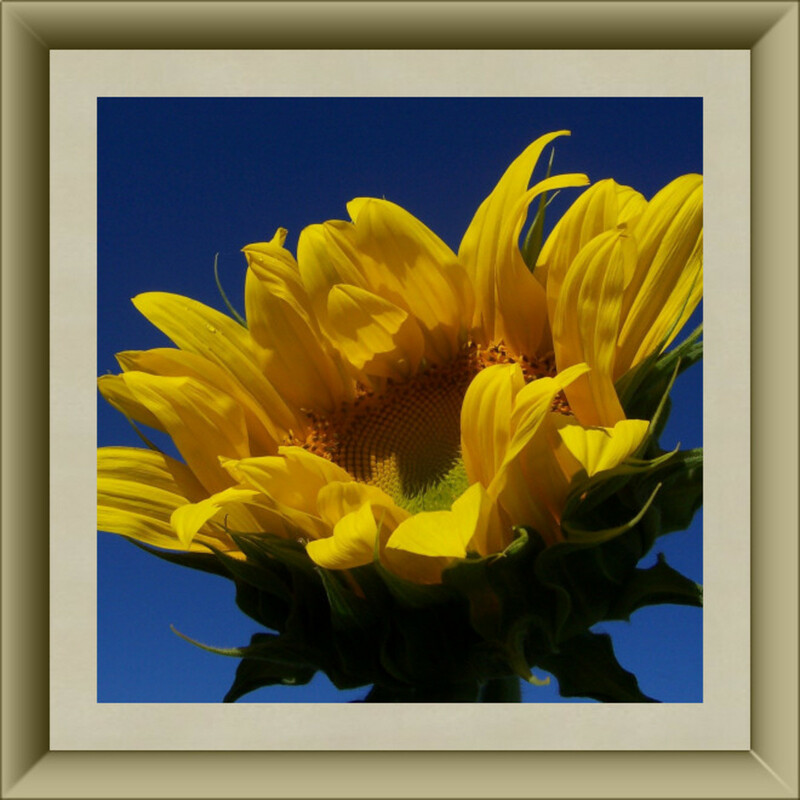 Use sunflower oil? I have. Eat the flower of the sunflower? Never? Well, you can! Now, I must tell you - there are varied opinions on this one. Some sources say the petals are poisonous. Other sources state emphatically - they are not! Our recommendation is to do your own research, but the consensus is, that the petals of the sunflower, eaten in moderation, are healthy and nutritious. As with anything else, eat them in moderation. Always be cautious, with any edible flowers. Eat them only if you know for a fact, that they are organically grown. Some people add them to potato salad, salad dressings, and mixed green salads, but If you don't wish to eat them - just use them to garnish your entrées, decorate your cakes, and brighten up your meals. 36 - Basil - An International Favorite! I have a husband, who loves to put basil leaves on his fresh tomatoes, but neither of us knew that the flowers of basil were edible, until recently. Now, the bees knew it, but none of them told me. To honeybees, African Blue Basil blossoms are like catnip to cats. They absolutely love it, and I am growing to love basil blossoms! Basil flowers come in a variety of colors, and flavors, and are used by chefs, worldwide. They lend themselves beautifully to seafood dishes, soups, and salads, and we located some dishes made with them, that sound delightful. You might like: Cheese and Basil Flower Omelette, Cold Avocado and Carrot Soup with Basil Flowers, or Feta Stuffed Chicken Breasts with Basil Flowers. My hat is off, to these creative chefs! 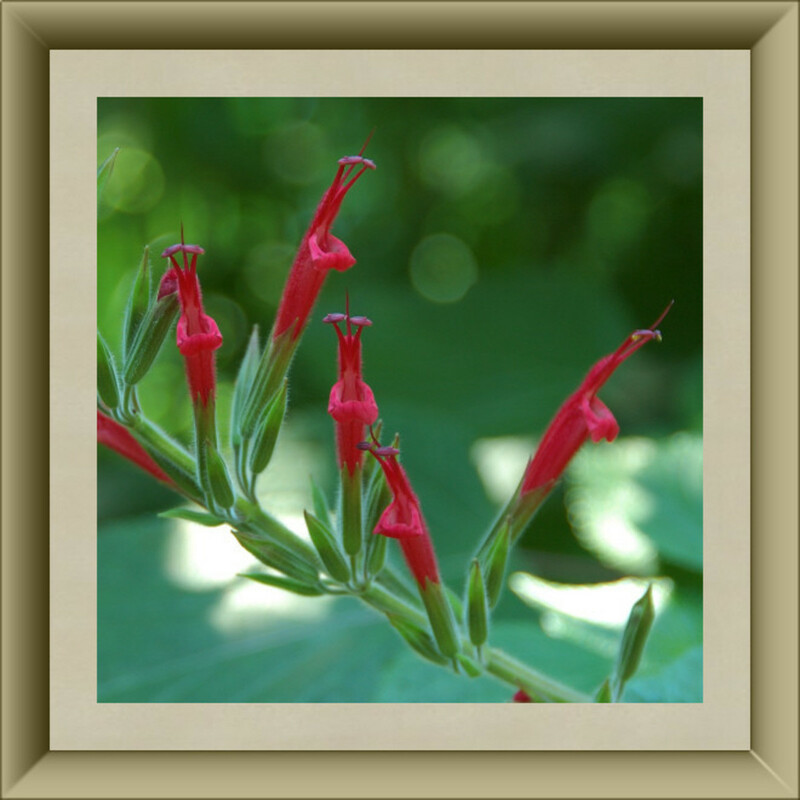 The pineapple sage blooms with an extraordinarily beautiful red flower. I read online, where one enthusiast said that pineapple sage should be called "Hummingbird Highway". That's because it attracts hummingbirds like it was "hummingbird bait". Pineapple sage flowers lend themselves deliciously to any recipe that calls for pineapple. From the Sooke Harbor House, in Vancouver, B.C., we found an entrée called Smoked Salmon and House Cured Salmon, with pineapple sage in it, that simply sounds delicious. Online, we also found recipes for: Roast Pork with Sage Flower Sauce, Pineapple Sage Salsa, Barbecue with Pineapple Sage Flowers, Banana Pineapple Sage Smoothie, and Pineapple Sage Flower Jelly, Pineapple Sage Corn Fritters Savory, and Pineapple Sage Pound Cake. What an unusual, delightful, delicate, edible flower, whose brilliant red color, alone - is enough to spruce up any dish! I'll bet you don't think of cattails as a flower, but they are! I can remember seeing them, when I lived up north, and hearing that you could eat them, but I have never had the opportunity to try them. Have you? They adorn the wetlands and marshes of the Northern Hemisphere, and are one blossom that the Native Americans feasted upon. Cattails don't look like flowers, they more closely resemble an overdone hot dog, but they are actually the flower of the plant. 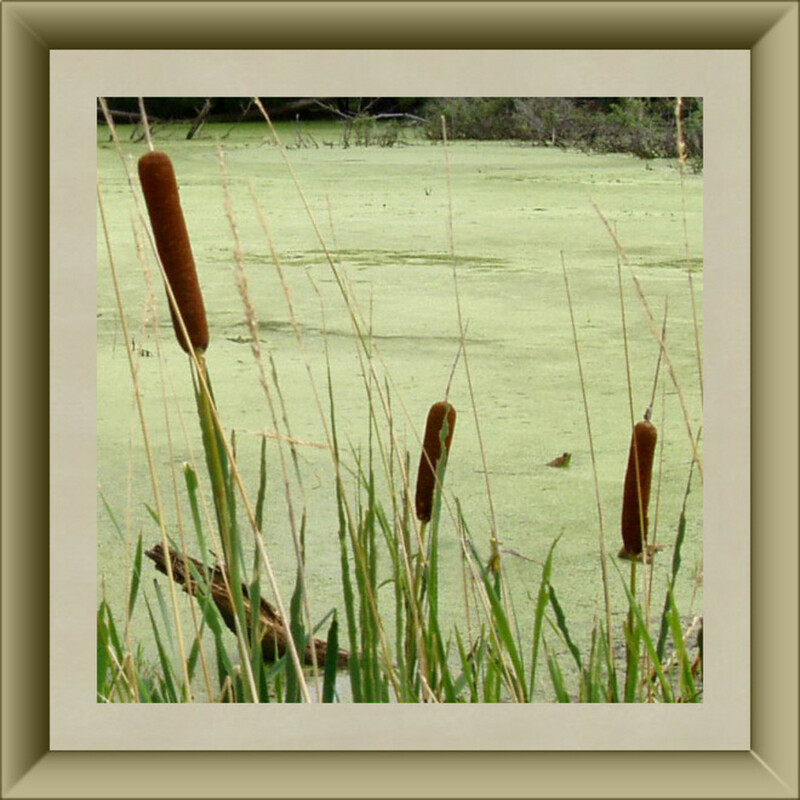 Cattails are best eaten when they are young. We found such dishes as: Cattail Pollen Pancakes, Cattails Pilaf, Cat on the Cob with Garlic Butter, Cattail Casserole, Cattail Flower Pickles, Cattail Barley Soup, Cattail Muffins, and Boiled Cattail Wild Rice. "Wildman" Steve Brill, shares that he eats sliced cattail hearts, sautéed in sesame oil, with wild carrots and ginger. Another daring "live off the land" adventurous soul made a recipe that I'd rather NOT try - Toasted Porcupine Stuffed with Watercress and Roasted Cattails Roots, no matter HOW good it is! This one's botanical name is EASY - it is Typha. How simple is that? At last, one we can spell, and pronounce. How refreshing! Oh, by the way - it's "TIE-fah", if you have trouble saying it. 39 - Gladiolus - Glamorous Good Eating! No matter how you spell it - gladiola, or gladiolus, or gladioli - that last one is the plural form - they are all the same gorgeous, edible flowers. 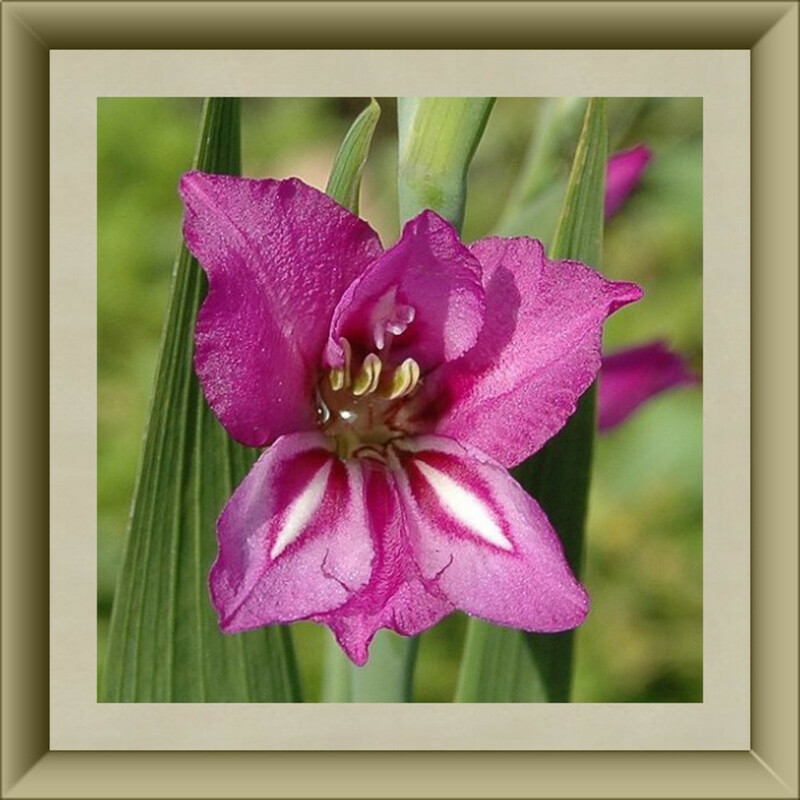 This incredible photo of a Gladiolus imbricatus, that's its botanical name - gives you a close-up view of the beauty of the bloom! You can use gladiola blooms in any salad, to add interest and color. Their mild flavor and soft texture blends beautifully with almost any ingredient that you could imagine to add to a tossed salad. We have discovered recipes for Gladiolus Sorbet, Stuffed Gladiolus, Gladiola Flower Omelette, and of course, Candied Gladiolus. In my opinion, they are best used as a garnish to main entrées. They literally "steal the show" with their extraordinary blooms, and add an air of elegance to any culinary presentation. Chamomile is the national flower of Russia, and this humble flower has more attributes than I can comfortably list. Both chamomile, and camomile are accurate spellings. 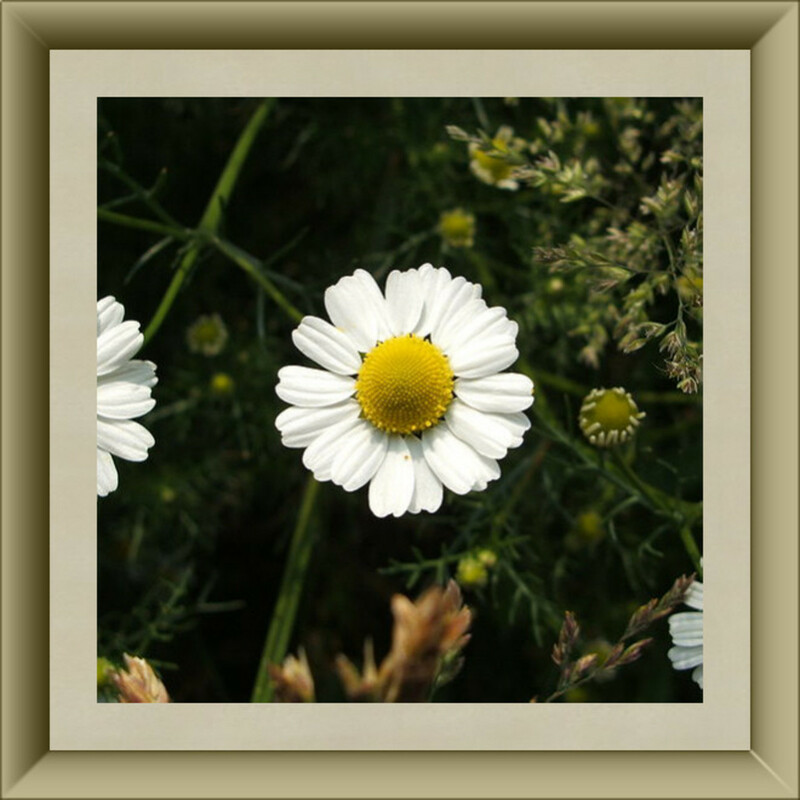 The photo is of German chamomile, which looks a lot like a daisy, to me! Its name literally means "earth apple", which is probably due to chamomile's apple-like aroma. Most of us who are familiar with medicinal herbs, are familiar with chamomile's renowned health benefits. However, a benefit that is not usually discussed, is that the petals - are edible! There are lots of recipes available, using chamomile flowers. We found: Chamomile Cauliflower Soup, Chicken a la Spring, Chamomile Risotto, Chamomile Rice Pudding, Berry French Toast with Chamomile, Chamomile Orange Cupcakes, Chamomile Cookies, Honey Chamomile Ice Cream, Chamomile Berry Salad, Cucumber and Chamomile Salad, and Sesame Ginger with Chamomile Vinaigrette. What Do 31 - 40 Taste Like? Chamomile - like apples, like honey, bitter - lots of opinions on this one. Edible Flowers 41-50 are: Fuchsia, Lemon Balm, Pea Blossoms, Begonias, Pineapple Guava, Johnny Jump Ups, Plum Blossoms, Dianthus, Apple Blossoms, Geranium. Recent interest in edible flowers makes this book a must, for every serious chef who wants the inside scoop on adding flower blossoms to their cuisine. Published in 1999, it is just one of the best cookbooks to be had, for those who like the unusual and exotic in their daily fare! 41 - Fuchsia - Almost Too Lovely To Eat! 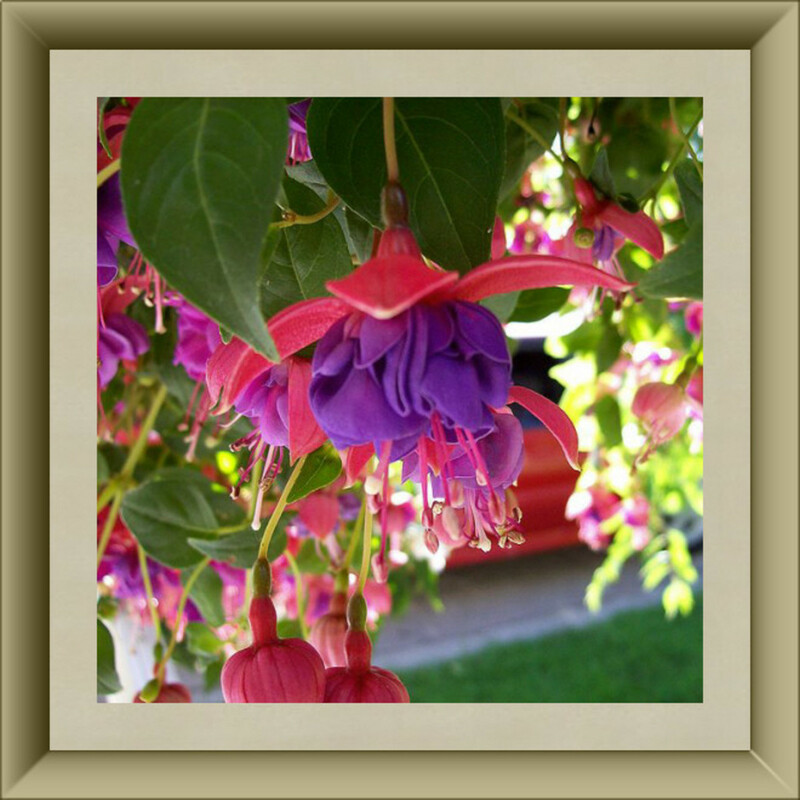 I used to buy my mother fuchsia plants - she so loved them. I had no idea that those gorgeous draping blooms were edible! Their extravagant looks are a conversation piece, no matter how you use them - as a glistening garnish, floating in iced drinks, or surrounding your stew. The deep royal purple centers, that seem to burst forth from the brilliant red outer petals, are a sight to behold. It almost seems a shame to eat them! Some of the extravagantly lovely recipes we found for using fuchsia flowers, are: Fuchsia Flower Fruit Salad, Fuchsia Flower Jam, Fuchsia Jelly, Fuchsia Jello, Candied Fuchsia Flowers. 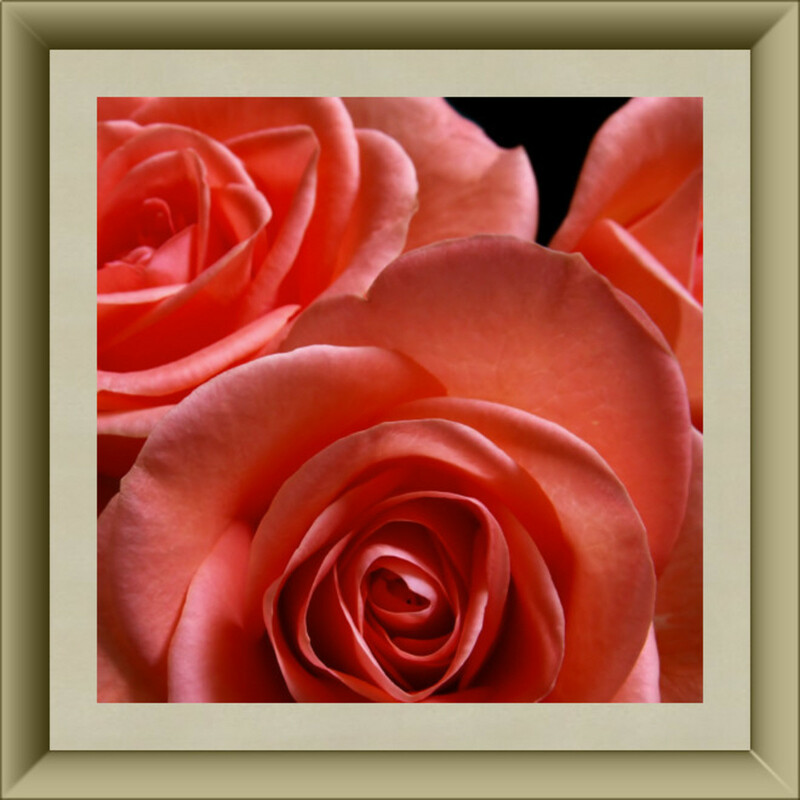 The "extravagance" comes from the beauty of the blooms, but the recipes are very simple. Fuchsia flowers blend beautifully into any sweet sauces, add intriguing color and flavor to pork entrées, and look marvelous floated atop any cold soups. They are simply stupendously lovely blossoms! Lemon balm, is Melissa officinalis, botanically speaking. 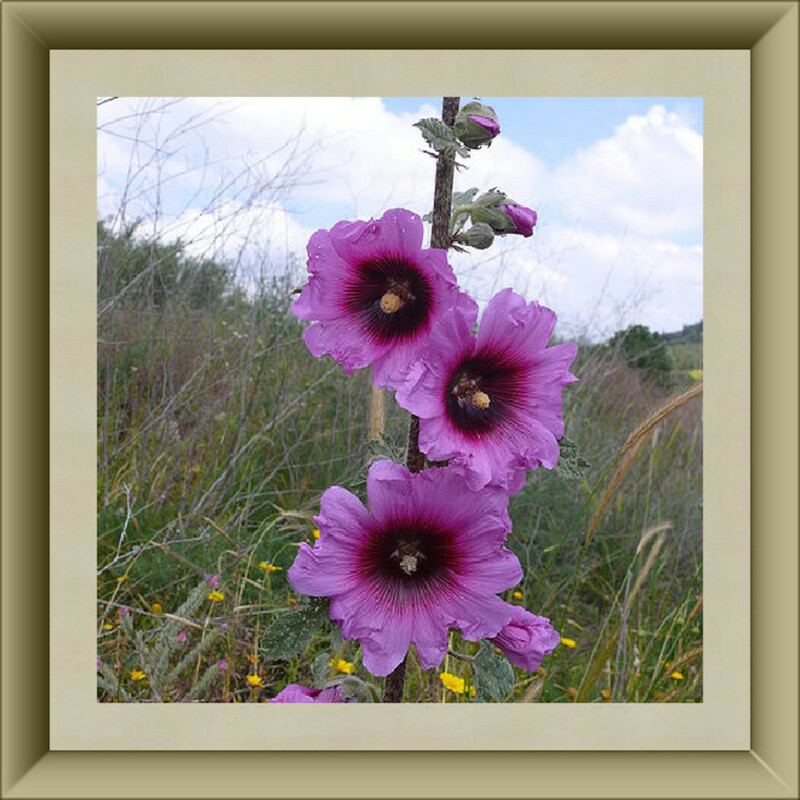 The first word of its botanical name "Melissa" is Greek for "bees"! 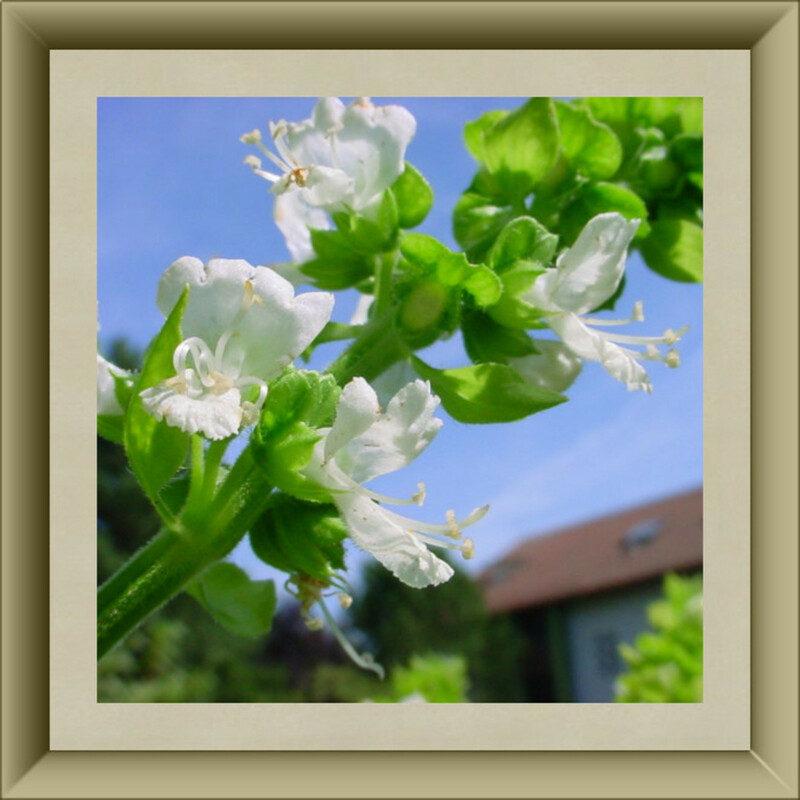 It is in the same Lamiaceae family as rosemary, thyme, oregano. At long last, this valuable, interesting plant is getting the attention it so richly deserves - on the table! Just look at its blossom - isn't that beautiful? It reminds me of a trumpet. The flowers are: candied, used to garnish salads, incorporated into sorbets and ice cream, sprinkled over rice, or added to any recipe that calls for the herb. 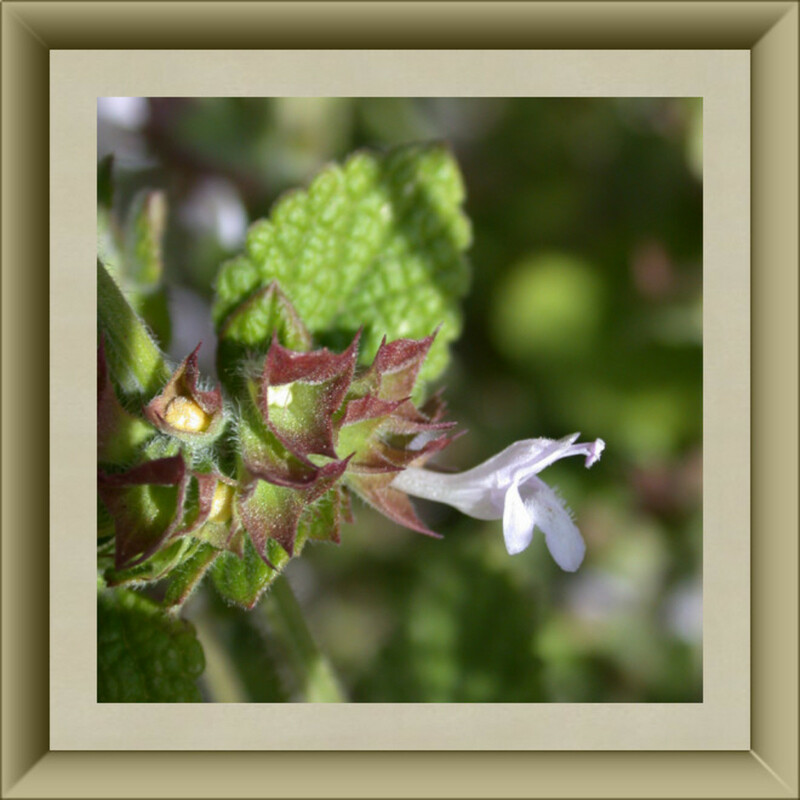 One very interesting fact about lemon balm flowers, is to be found on Melissa Morrison's webpage - Dr. Christopher's Herbal Legacy: Lemon Balm. She tells us that lemon balm flowers were an essential ingredient in the famous "Carmelite Water" perfume recipe. According to her informative page, Carmelite friars were responsible for making the perfume, and the recipe was a closely guarded secret. It was actually patented under the name: "Eau de Melisse des Carmes", and patents were issued under the reigns of the French rulers Louis XIV,XV, and XVI. Her information is most definitely worth the trip to her webpage, for historical interest and enlightenment about this extremely interesting herb, and its flowers. 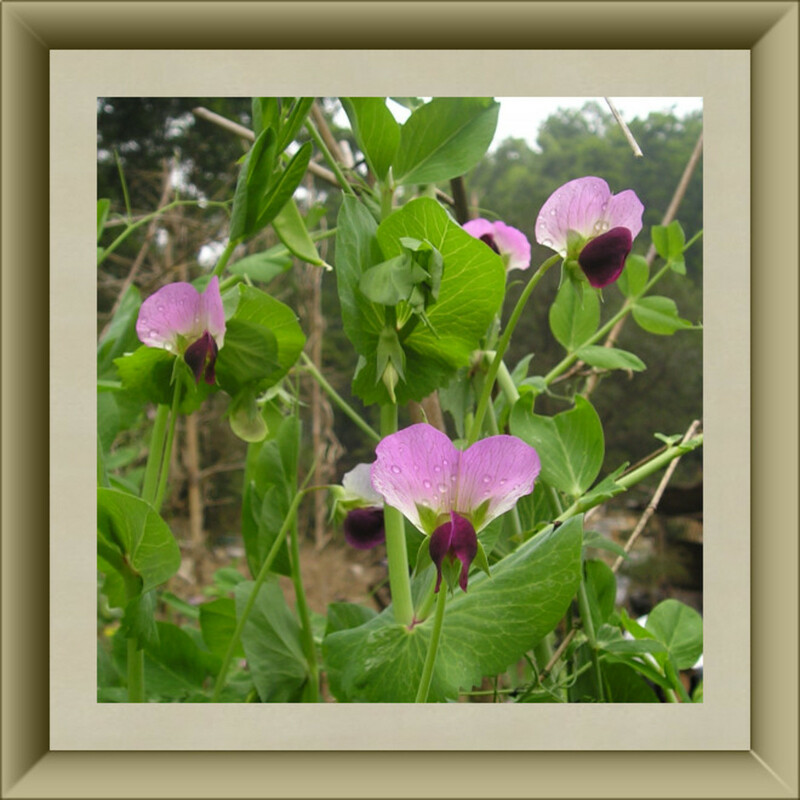 Do not eat "Sweet Pea" flower blossoms, or any other ornamental pea blossoms - they are toxic - but the blossoms of the common pea, and the snow pea, are edible. This darling photo is of snow pea blossoms, aren't they lovely? Sugar Snap Pea flowers are also edible, but these two mentioned, are the ONLY pea flowers that are recommended eating. There are lots of different varieties of peas, so if you are going to eat pea blossoms; be certain that the variety you have is edible...or...do without! Because their flavor combines well with so many other foods, recipes for eating snow pea blossoms, are easy to create. A few that have been tried successfully, are: Snow Pea Flowers and Shoots Sauteed with Garlic and Oil - called "Do Miau", Macaroni Salad with Carrot and Snow Pea Flowers, and the usual Candied Snow Pea Flowers. 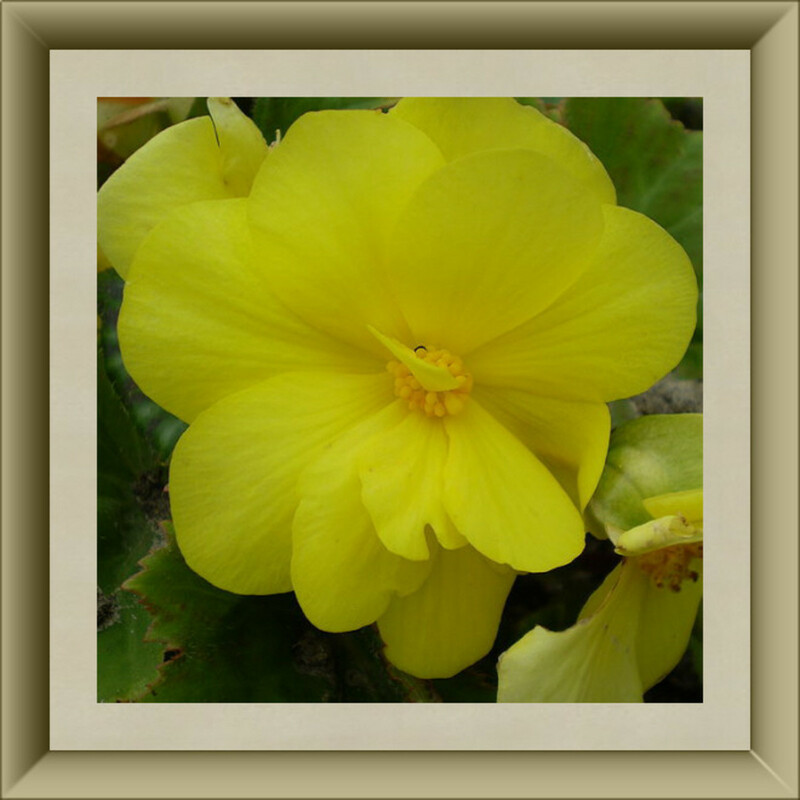 44 - Begonia - Just The Tuberous Ones! This begonia - begonia tuberhybrida is an edible flower you will just have to try! You'll see what it tastes like, below. The flavor will most likely surprise you - it surprised me! Warning - Eat only the petals of the "tuberous hybrid begonias". Others can be toxic. "When in doubt - leave it out!" With all of the different colors of begonia flowers that grow, you can really create some beautiful rainbow-hued dishes, with flavors that will amaze your diners ! 45 - Pineapple Guava - A Feast For The Eyes! This one is almost too beautiful to eat, isn't it? This has to be one of the most arresting flowers I have ever seen. 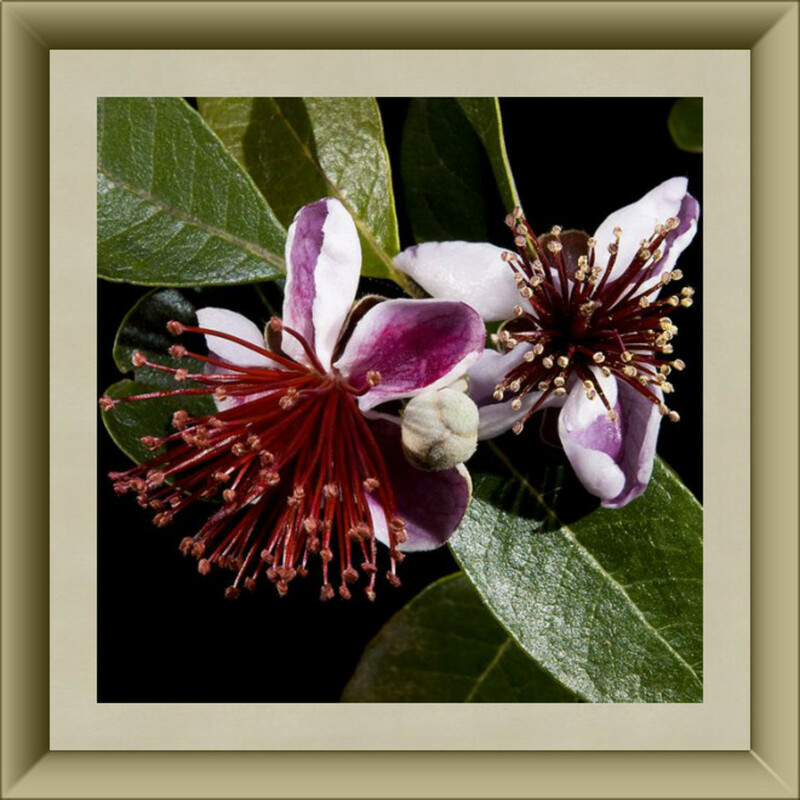 The technical name for the plant, is Feijoa sellowiana but, it is commonly called pineapple guava or guavasteen. Most people are familiar with its fruit, but not many people know that you can eat the blossoms. Pineapple guava hails from Brazil, originally, but it is grown all over South America, Central America, New Zealand, Australia, and even in Scotland. We have actually found references to people successfully growing it - worldwide! Predominantly in tropical countries, the flowers are used in: Pineapple Guava Flower Yogurt, Guavasteen Flower Ice Cream, Pineapple Guava Jam, Fejoi Fritters, Pineapple Guava Flowers Marmalade,and Pineapple Guava Flower Fruit Salad. In the US, Pineapple Guava is just getting its "just desserts", as a delicious, edible tropical fruit - with flowers that are a delight to the eyes, and a pleasure to the palate. The common name for these dainty flowers, is tri-color violas, but this type is often referred to, as Johnny Jump Ups. Wait until you get to the section below, and find out what THEY taste like! One "neat" thing about them, is that you can use their petals to thicken stew, soup, or sauces. Just remember - their flavor is more distinctive than other thickeners, such as flour, arrowroot, cream of tartar, or potato flakes. Using them may result in a very memorable meal - one that does not conjure up warm thoughts of repetition, in the diners' minds! The Backyard Herbalist, Ernestina Parziale, has a recipe for Johnny-Jump-Up Jelly that is simple, and delightfully different from most jellies on the grocer's shelves. We also came across Johnny Jump Up Spring Salad, Johnny Jump Up Cider, Johnny Jump Up Mint Jam, Johnny Jump Up Mint Ice Cream, and Johnny Jump Up Whipped Cream Cheese. Did anyone else know that you could eat plum blossoms? Not only are plums delicious - plum blossoms are delicious! Of course, you won't have as many plums, if you eat a lot of the blossoms, but plum trees are loaded with them! 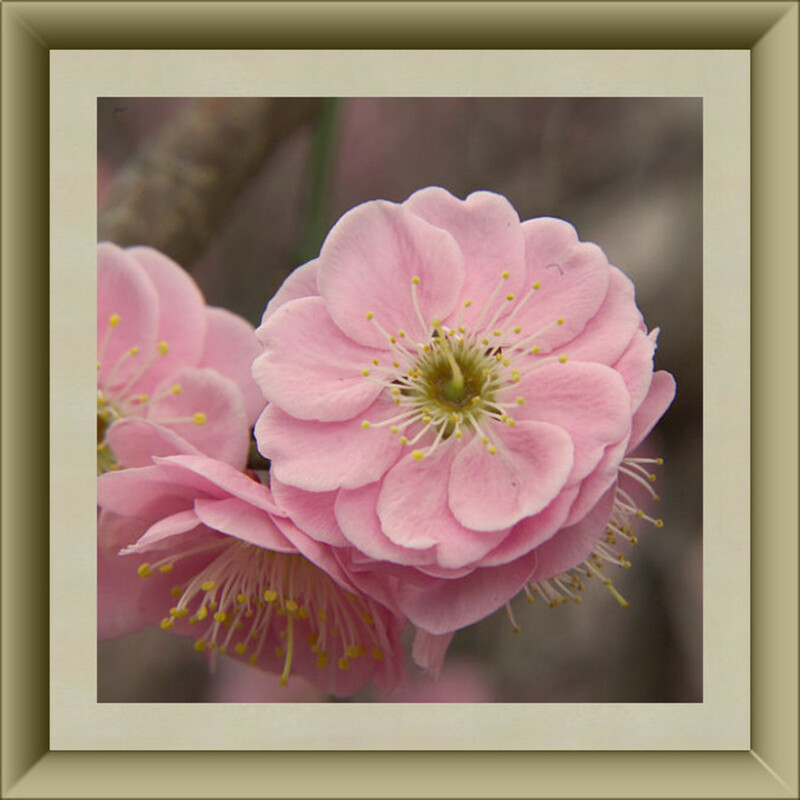 The Chinese refer to plum blossoms as one of the "Four Gentlemen". The other three are orchids, bamboo, and chrysanthemums. Quite an honor, don't you think? Even though the Chinese plum more closely resembles an apricot,- it is still, a plum. Here are a few ways we found, to use plum blossoms in the kitchen: Candied Plum Blossoms, Plum Blossom Sorbet, Plum Blossom Jelly, and Plum Blossom Salad. From Frog Hollow Farm, we found - Plum Blossom Ice Cream with Frog Hollow Farm Plum Sauce and Pound Cake. As sweet as they are, we need more good recipes for them, don't you think? The name literally means "God flower". 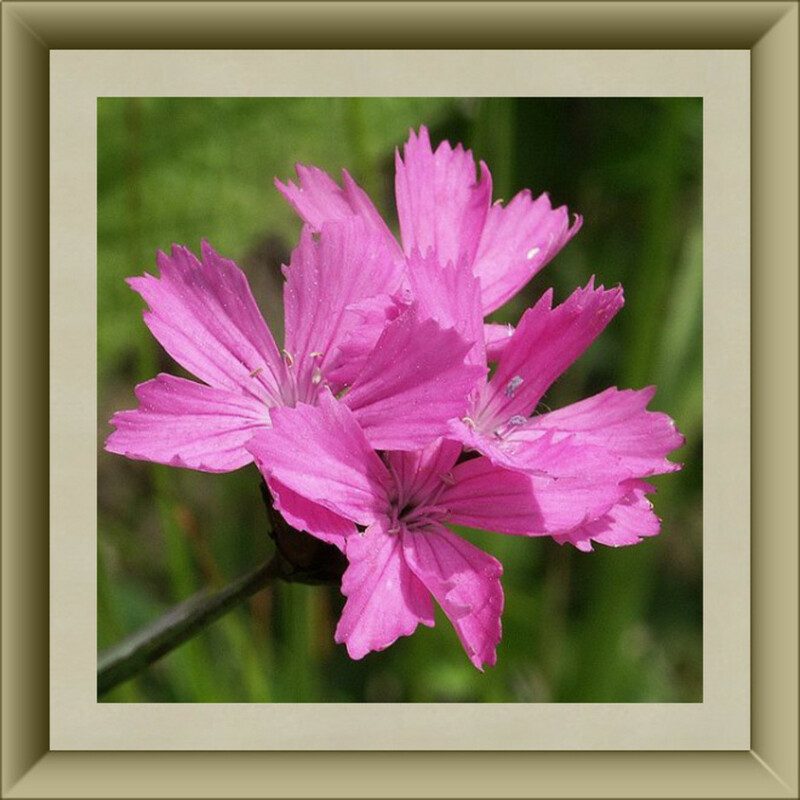 Well known to the home gardener, as pinks, not many know that almost all dianthus flowers are edible. Carnations are a variety of dianthus, as are Sweet Williams, both of which are featured here, in our list of fifty flowers that you can eat. From The Free Library website, we found a recipe using dianthus petals that has a delightful name. How does Purple Flash Spinach Salad "hit you"? You can also make: Dianthus Flower Fondue, Dianthus Petal Butter, Dianthus Blossom Honey, Dianthus Mixed Greens Salad, Pickled Dianthus Buds, Candied Pinks, Dianthus Pink Jello and Candied Dianthus Blossoms. Get busy being creative, and suggest some more! 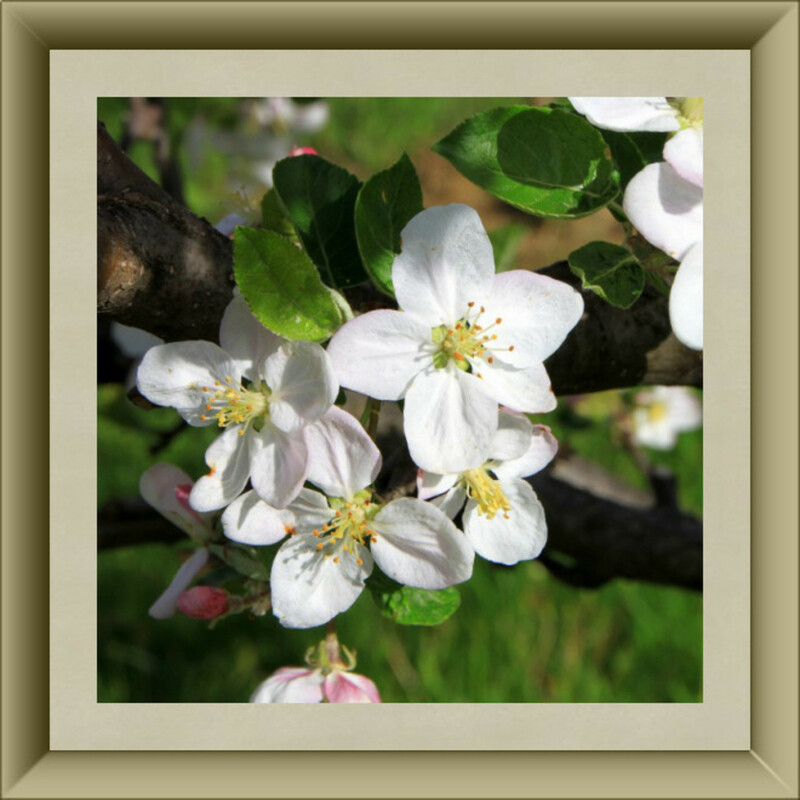 Did you know that apple blossoms are the state flower of Michigan and the state floral emblem of Arkansas? Well, they are. I didn't know that, either, until recently. We found very few recipes using apple blossoms, but several references to Candied Apple Blossoms. Other than one more reference, that I found, to Baked Apple Flowers, it appears that the field is wide open for novel apple blossom recipes. If you happen to have some, let us know! 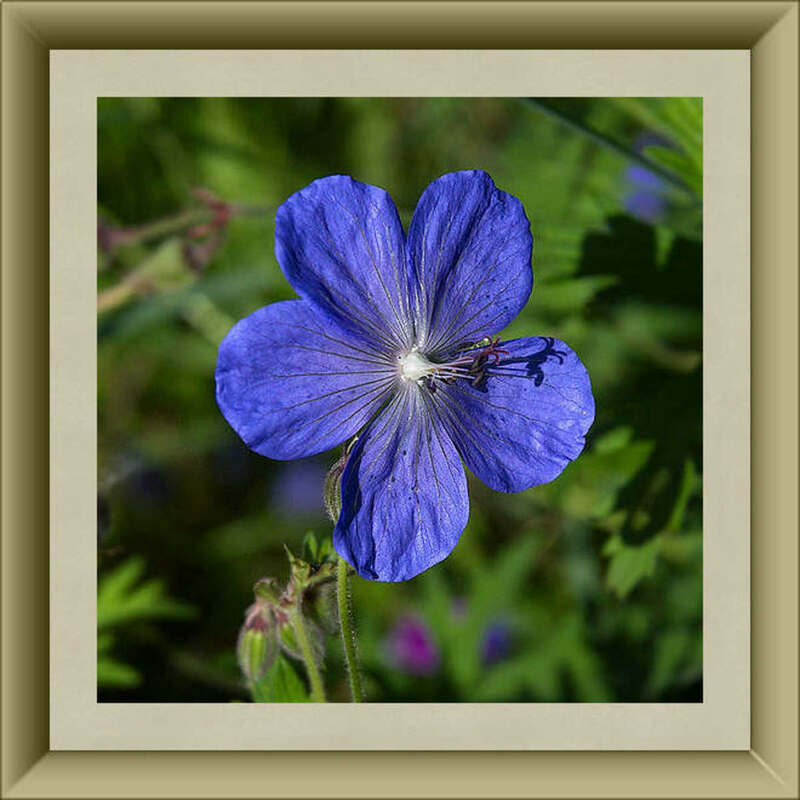 50 - Geranium - Especially Scented Ones! Most of us are very familiar with geraniums, but we don't usually eat them. But, we can! My mother just loved geraniums. I didn't like them at all - but, I didn't know then, that they were edible! Whenever I used to think about geraniums, my mind would conjure up a big ball of red flowers, all in a cluster - to me, those were geraniums. Well, they didn't smell good to me, and we had a lot of them to smell! Well, lo and behold! I found out that geraniums not only come in many, many different colors - like the spectacular blue one in the photo - but they are delightfully tasty to eat, too! One very interesting aspect of geraniums, is that - according to the color, the taste of the blossoms is specific to the color. I haven't tasted one yet, but understand that the lemon-scented ones actually taste like lemon, and from there - the taste extravaganza goes on! There are many articles online, about cooking with geraniums. They generally say that scented geraniums can taste like apple, ginger, peppermint, chocolate, nutmeg, and lime, to name a few. Some of the recipes of interest that we found, were: Rose-Geranium Pound Cake, Victorian Rose Geranium Cake, Apple Geranium Jelly, Citrus-Scented Geranium Cookies, Herbed Butter with Geranium Leaves, Scented Geranium Dressing, Rose Geranium Punch, Rhubarb Pear Crunch Scented with Rose Geranium, Fresh Peaches Gratin with Rose Geranium and Cardamom, and TONS more! What Do 41 - 50 Taste Like? Pea blossoms - like peas - fancy that! Geranium - like many different flavors, from lemony to minty, and everything in between. Here are a few to try that are not in our list of 50 Edible Flowers, above. and there are a whole lot more! How can I begin to describe the book? Amazon does a spectacular job of it, and the author must be from England, because "color" is spelled "colour". Definitely a must, for those who wish to expand their culinary horizons! Do you, have you, would you...eat flowers? Please tell us your opinion, or experience, with edible flowers. You know that - the more we are aware of how many beautiful flowers are safe to eat, the more people can add them to the edible landscaping they plant!. What Is your experience with Edible Flowers? We have read that some orchids are edible. Unless you absolutely know what you are doing - DON'T EAT THEM. Many are not edible, and they are easy to misidentify! Besides, my husband grows orchids, and if he found out that I was encouraging people to eat them, I cannot even imagine the consequences! From a great website - Food.com - here are some great ideas for using edible flowers in your cuisine. The site is a feast for the eyes, and a "help in times of trouble" - like when you get stuck in a rut, and need a new idea for breakfast, lunch, or dinner! P.S. Don't miss French Tart's incredible Fresh Floral Ice Cubes! To see the photos and recipes, simply visit the Food.com website, and type in the names of the recipes shown above. The author promises to turn what is on your plate, into a "painting". That's the ticket for me, because I am just thrilled to get dinner on the table at night, forget about the "presentation". Flowers, edible flowers, do something to an entreé, that is difficult to accomplish in any other way. Love this book! Common Sense Cautions - PLEASE READ! At the risk of being redundant, you need to insure that anything you put into your mouth, is edible. Take the time to identify your flowers! Be certain that you know exactly what you are eating! 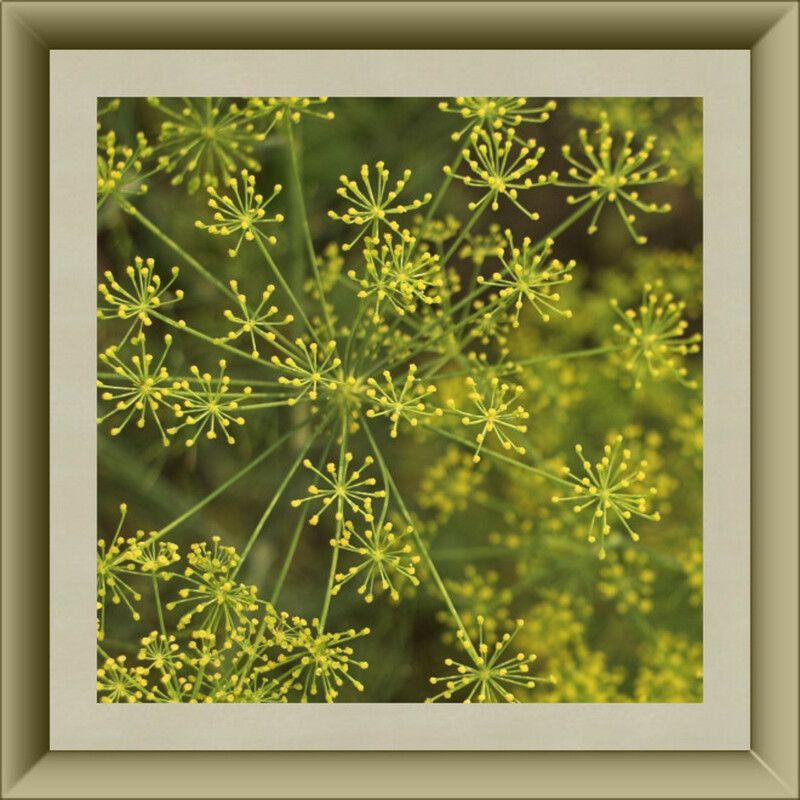 Fennel - the blossoms are edible, but they have "look-alikes" that are deadly. Unless you are growing fennel, or extremely familiar with fennel, don't eat flowers that look like fennel. Wild Iris - also called Yellow Flag or Blue Flag. They resemble cattails. 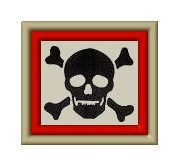 They are toxic! Queen Anne's Lace - Don't eat it, I don't care what people say. This plant is much too easy to confuse it with hemlock, when it is young. Unless you have a degree in botany, or are an expert on flowers - leave it alone! #2 - Find out whether or not the flowers or the flower buds, need to be cooked, before ingesting. Some edible flowers do, so educate yourself - first! To quote an old adage - "look before you leap." Sorry - just kidding about that! The saying is - "know, before you eat", and you can add this one - "better safe, than sorry"! #3 - Only eat flowers from plants that have been organically grown. Unless you enjoy eating chemicals - via pesticides and fertilizers - either be certain that the flowers are grown organically, or, grow them, yourself! When it doubt - leave it out! Experimentation may bring disastrous results - so I strongly suggest - AGAIN - before you eat ANY edible flowers - make sure that you know WHAT you are ingesting! There are 160 pages here, of ways to use edible flowers. The flavors of edible flowers range from the exotic, to the exquisite - and all, are palatable. In this treasure, you will find ways to incorporate flowers into your cake decorating, jellies, sauces, stews, and even shortbread - in one easy to read, delightful book. Banana Blossoms - AND - a recipe! This is not an article about recipes, but..
...a fellow writer here reminded me about Banana Blossoms, and offered me her recipe. In gratitude, I have included it here for your enjoyment. How we could have missed THIS one, I do not know! My husband and I grow bananas, and have more banana trees than we can keep after, so...I feel a bit mortified that I did not include BANANA BLOSSOMS! Well, here is a photo of them, and her recipe, is below. All of the credit for this one, goes to her. 2 inch section of Pandan leaf - used in a lot of Southeast Asian cooking, especially Thai cuisine. Fry the onions and garlic in a small amount of oil or butter with curry leaves and pandan leaf, until all are soft. Remove the first two outer petals of the banana blossom and chop the flower into a bowl of water with a teaspoon of salt. * Note: This step helps to remove the resin from the flowers. Rinse thoroughly, and drain off all of the water . Now, add the chopped banana blossoms and chopped chilies, to the frying pan, with the onions, garlic, curry leaves, and pandan leaf. When the flowers soften, add the tuna flakes, if you have them. Serve as a side dish with rice or flat-breads. If you haven't tried lilacs in yogurt - you haven't "lived"! Well, that's going a bit far, but that is just one of the ways that the author illustrates her creative ways to add edible flowers to your cuisine. Wisely, the author includes warnings to poisonous plants, that could possibly be misidentified, as edible. Float them on top of soup. Layer the petals into homemade wraps. Use the flowers as edible garnishes. Put the spicy ones in tacos. Add the "nutty" ones to meatloaf. Blend the sweet ones into your smoothies. Use the flowers in homemade ice cream. Mince, and whip into cream cheese, dips, and spreads. Put the "oniony" ones on top of hamburgers. Incorporate the sweet ones, in your pies. Use large flowers' petals as your salad base. Experiment with the "perfumey" ones, in iced tea. Blend the whole flowers into sauces. Whip some into softened butter. Put sweet ones into jellies, and make marmalade with the "citrusy" ones. Use brightly contrasting flowers, to make 7-layer salad. Add flowers to Jello, or other gelatin dishes. Experiment with various ones, in egg omelettes. Sauté the vegetable-tasting ones in olive oil, with garlic and salt. Pickle the immature flower buds. Chop any edible flowers, and add to homemade bread or rolls. Incorporate any peppery, spicy ones, in your homemade chili. When your grilled shiskabob is finished, skewer flowers on each end. Stir the sweet, aromatic ones into yogurt. Add layers of petals to cold sandwiches. Bake spicy, "oniony" whole flowers and petals on top of pizza. Include petals in your homemade spaghetti sauce. Put whole flowers, petals, and buds into casseroles. Spruce up your homemade cakes with flowers on the icing. 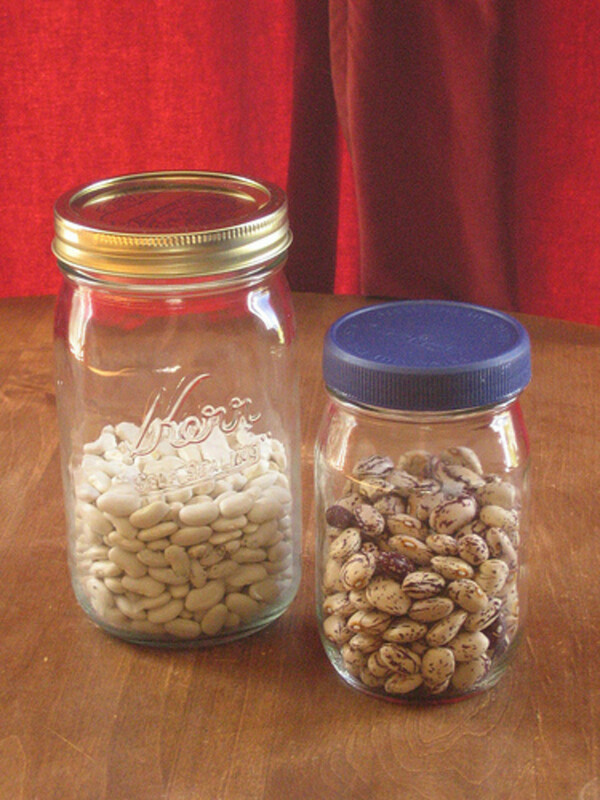 Add the sweet ones, to homemade candies. Put petals into your soufflés, and whole flowers on top, when it's finished. Include them in your turkey stuffing and breading mixes. Try them in stuffed mushrooms, squash, and seafood. Decorate iced tea, with the flowers. Experiment with adding them to sushi. Mix them into potato salad, egg salad, chicken salad, and tuna salad. Put sweet, bright ones into ambrosia salad. Add minced flowers to your potato pancake mix. Put flower petals in your homemade muffins. Use them when you make homemade noodles. Make twice-baked potatoes and add petals to the stuffing. Roll flowers that taste spicy and sweet into phyllo dough, add your favorite sweetener, butter or oil, and bake. Dress up your chicken salad with petals, and garnish with the whole flowers. Add "vegetable-tasting" and "oniony" flowers, to wild rice. Fold petals, right before cooking, into pancake batter. Dry the flowers, mince them, and add to salad dressings. Make slits in steak, and stuff the slits with aromatic spices and blossoms. Use chopped, diced, or minced flowers in your cornbread mix. Cook quinoa, teff, amaranth, chia, rice, or any wholegrain, and add flower petals at the end. You can also put the flowers in vases, on the table, and encourage your family and company to eat them. You'd better have a book or two about Edible Flowers around, or some of them won't believe you! Inside this volume, are great full-color photographs, and ideas for how to use edible flowers in your kitchen - ranging from drinks to desserts. Written by a woman who hosted two of her own television series, this little "kitchen companion" of edible flowers is sure to please! What does a 25th wedding anniversary bring to mind? Silver, right? Gold is for the 50th, diamonds or pearls for the 30th, and on it goes. Did you know that some of our 50 edible flowers are considered traditional wedding anniversary flowers? Well, they are! Most people are not familiar with the special flowers that commemorate certain anniversaries, so we thought we would help to spread the word! If you wish to enjoy eating edible flowers, do yourself a favor, and learn more about them. Once you have an understanding, of which ones are safe to eat - and of course, which ones you ENJOY eating, you can share the information with others! One of these links, is to a company that sells edible flowers. P. S. All of them, can be used to make tea! Great website on how to eat things you can find growing wild in your area, including - of course - edible flowers! 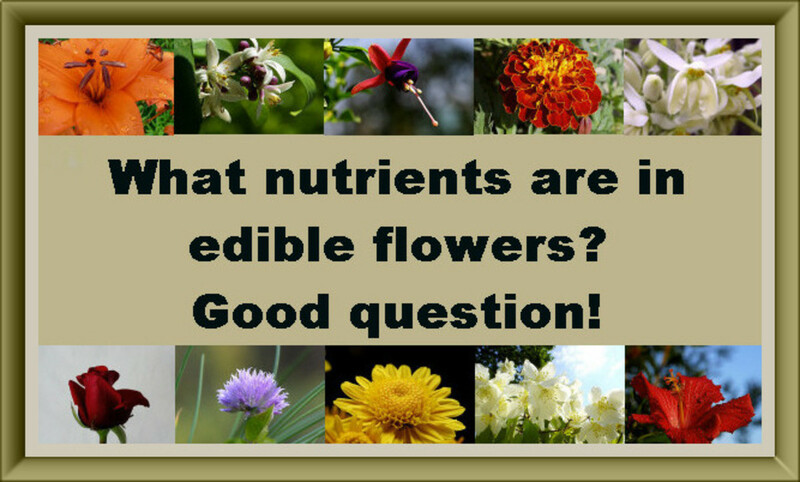 How Nutritous Are Edible Flowers? That is an excellent question. The answer is - no one seems to KNOW, exactly! In our research, we found that most of them are packed with lots of Vitamin C and Vitamin A - but it is "doggone" hard to find out anything beyond that. All raw fruits, vegetables, and herbs have enzymes in them - essential for the proper digesting of food, but you will be on a mysterious journey when you try to track down the specific vitamins and minerals to be found in edible flowers. We did track down a lot of folklore about edible flowers, and a lot of it is based upon facts. You might be enlightened to read what we found about eating the blossoms of the following flowers. * Daisies are supposed to cure insanity - give some to our legislators! 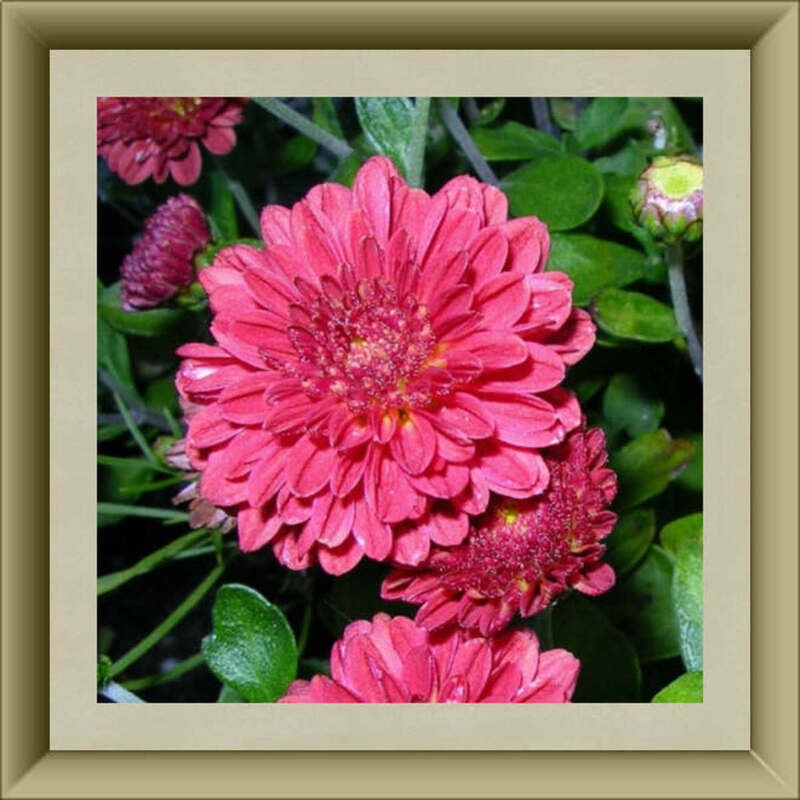 * Chrysanthemums will ensure a long, healthy life - I suggest you start eating them today. * Impatiens? The cure for impatience, of course! ...and there are many, many more. Red Clover Blossoms - calcium, chromium, magnesium, niacin, phosphorus, potassium, thiamine. 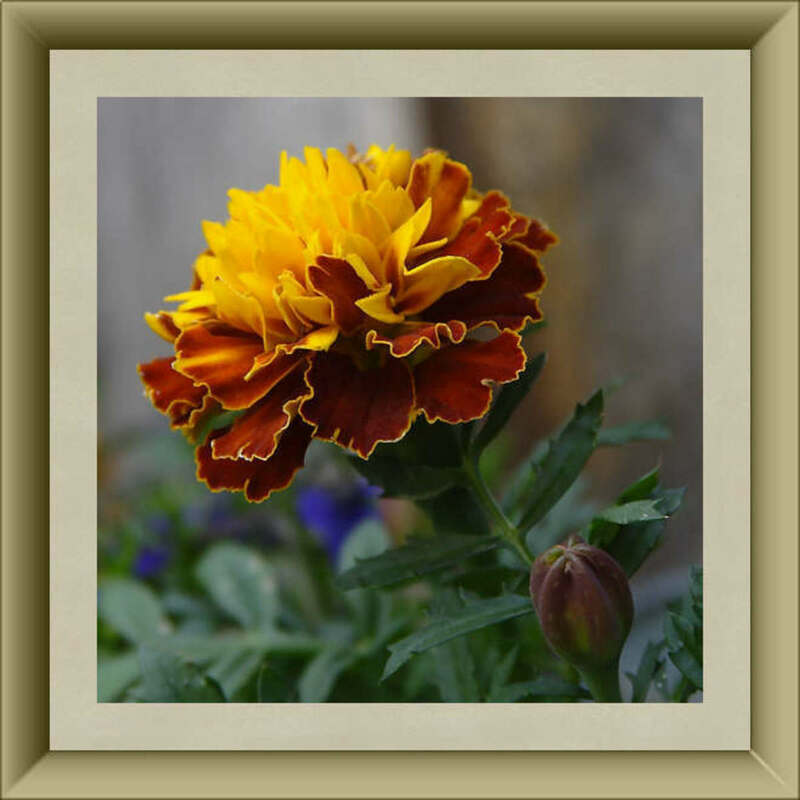 Marigold Flowers - high content of lutein, a powerful antioxidant. Oh, we found a lot of speculation, but other than that, we merely found references which stated that the nutrients in the flowers of the plant, were comparable to the nutrients in the plant, itself - not really very helpful, if you ask me. Some flowers of plants are edible, while the plant itself, is NOT, and vice versa! Flower remedies have been used for thousands of years, and I believe that some in-depth studies are in order, to delineate the specific nutrients that are contained in edible flowers. I say, it's about time - what do YOU think? an alternative arrangement for you! Give the folks at Flowers to Eat a call, and see if these "tickle" your taste buds! Bon Appétit! PHOTO CREDITS - Thank you - one and all! We believe in giving credit, where credit is due. - No attribution means the photo is in the public domain. 2. 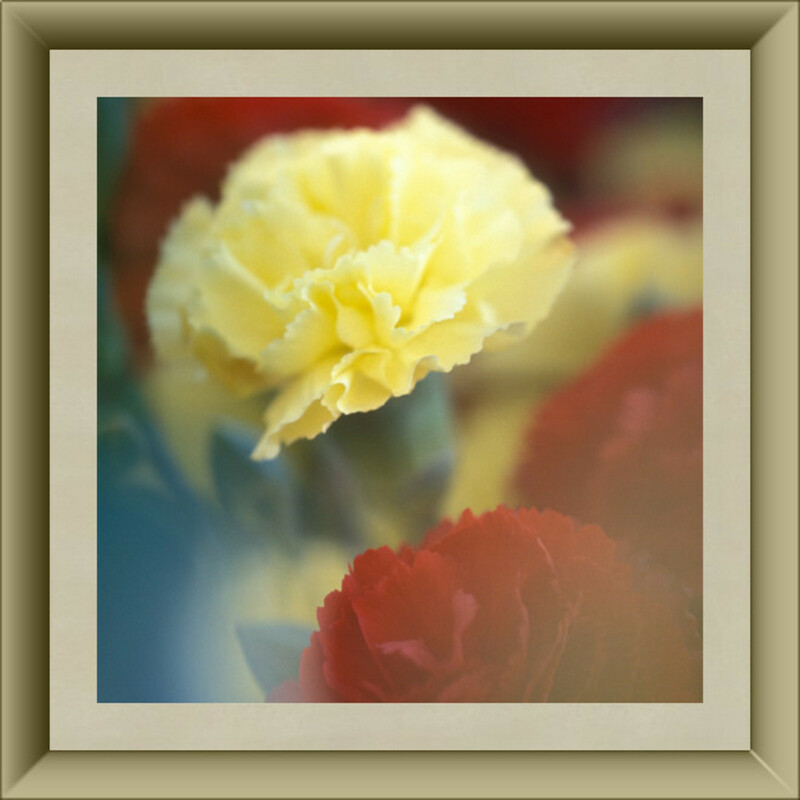 Carnation - Originally; free photo from Dreamstime, but is no longer there. 3. 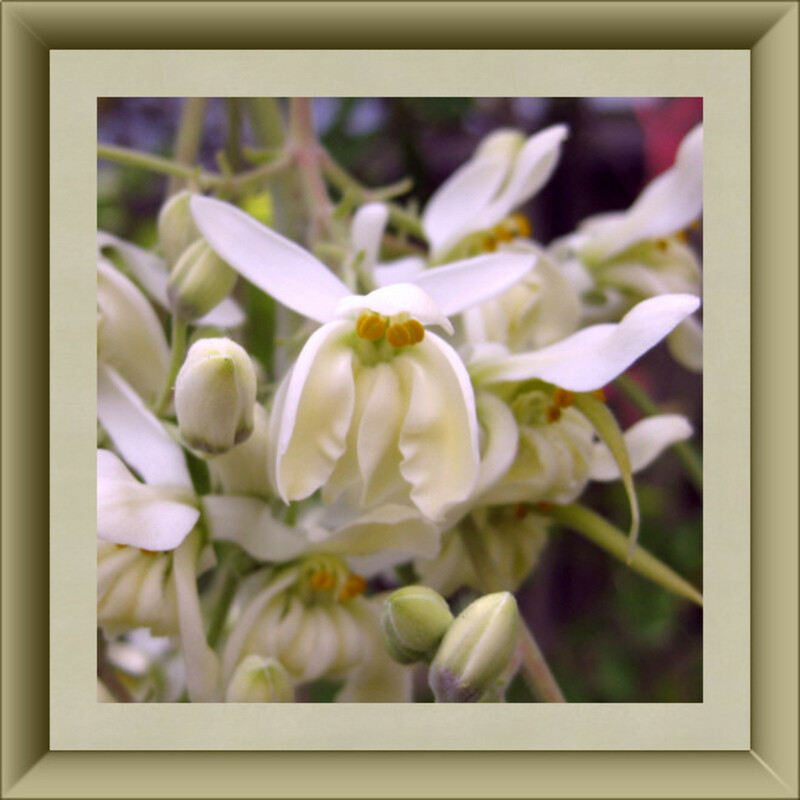 Moringa blossoms - Photographed by the author. 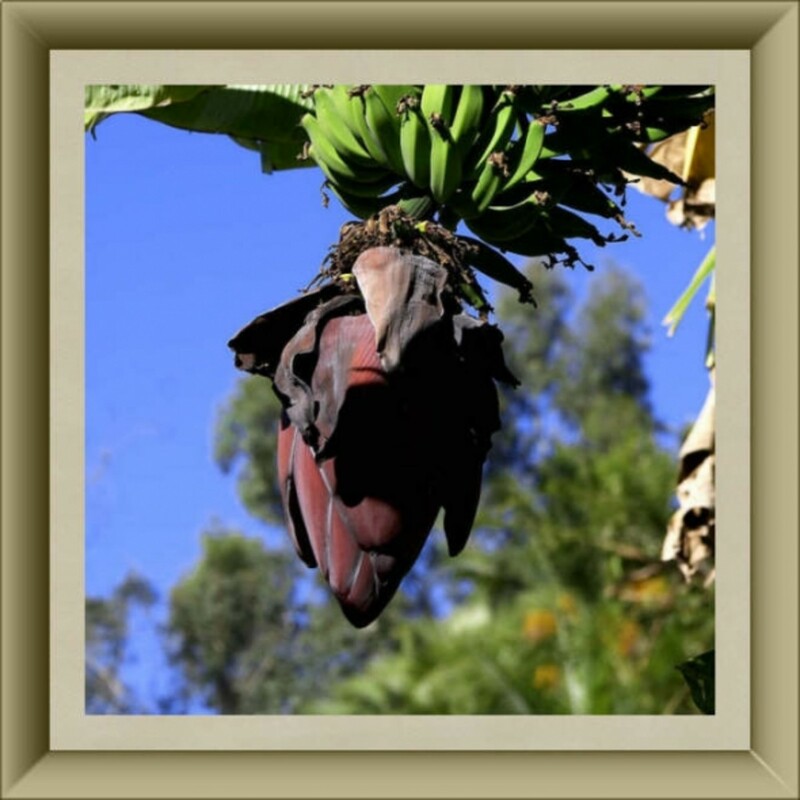 Also in the Public Domain - the Banana Blossom photo above the recipe. Many thanks to: Wikipedia, Wikimedia Commons, PD Photo, and all of the people who put their photos in the Public Domain! - "PD" means the photo is in the public domain. Please let us know if you liked our article! Are you an Edible Flower Lover? - Tell us what you think! MANY apologies to several of you - I simply did not see your comments! Marion, Lena, and Mohana - thank you for your kind remarks! I am so very glad you liked the article. Just recently, I ate several Dendrobium orchids - they were delicious! I've loved candied violets since I first tasted them as a child. As an adult, I dry my own homegrown hibiscus and lavender, so I tend to use those in my baking. What a comprehensive article about flowery edibles. My pleasure, rolake! I am delighted that you enjoyed it! ologsinquito - I'm sorry, but I could not reply any closer to your comment. I am really glad you liked the article. It was a lot of fun, writing it, and doing the research. The warnings, I would like to have displayed in huge letters, so they could not be missed - but, evidently they did not escape your attention. Thank you, ArtDiva. Yes, it took some time to write it, and your suggestion to publish it is very kind, too. I am not in CA, but have had a few edible flowers served with my meal in restaurants. Unfortunately, they forgot to tell me I could eat them. I eat them at home, though. As my husband - he thinks I'll try anything that grows! Thank you, Audrey! I am so glad you enjoyed it. There are many, many more, but I just wanted to highlight some to whet the appetites of those who "happen upon" the article. Wow what a great article! Who knew that so many flowers were edible? Wow! This took some time to pull together. Beautiful imagery to compliment the copy. You should publish this as a small handbook. In Sonoma, CA, there are several growing farms with edible flowers, and served as a salad garnish in many of the restaurants. There's so much information here, I'll have to come back and reread. Nicely presented! This is an amazing article, packed with so much wonderful information. The photos are beautiful, and I like how you wove in the warnings, as look-alike plants can be deadly. But if you know what you're eating, that's a different story. I'm sure these flowers are also packed with medicinal properties. Voted up, shared and more. Thank you, tony55! I am really glad you enjoyed it. I enjoyed writing it, and learned quite a few things while I was researching it. You are welcome. I just spoke from my heart. I do admire your talent and patience in coordinating all of this information. I can define it in one word: Amazing. And a warm thank you for following me. I cherish my followers and that includes you. Thank you, Kenneth. I am so glad you liked it, and yes, it took a long time to get it all together. It always puts a smile on my face when someone enjoys reading it. Hopefully, some of the information will come in handy, too, as you mentioned. When in a survival situation, some of these edible flowers might just save a life! Wow! How long did the research take you for this piece? Amazing read. And very helpful and not to be cute, if you are stranded somewhere alone or with someone and you are without food. I suppose that you know that the information in this hub could save someone's life? Very interesting. I never knew there were so many edibles. I always remember my late husband popping a marigold into his mouth that was garnishing the salad a very formal wedding reception. He got this look on his face and tried desperately to get rid of it in his napkin without anybody noticing. Tickled that you liked our article! Thank you - glad you liked it! The photo credits list was a long one, so...I "compacted" it. Sorry this is late - hard to keep up. I actually eat lotus root, but only the root. I am so gratified that liked this. I agree, try the edible flowers first, with dessert. That is a great way to introduce yourself to them! Elsie, I think you are on to something! Perhaps you could "foil" the flying fiends next year, so you might be able to enjoy some of the "fruits of your labor" - pun intended! Just returned from the other day, I have become very interested in edible flowers. I had to smile when I seen the Plum flowers being edible, I think the birds have all ready discovered that, as I haven't had any plums on my trees for four years, and they are covered with flowers in the spring. I agree with you, Swisstoons. So glad you enjoyed it, too! Thank you! Excellent! I knew about a few of these, but had no idea there were so many edible flowers. Wouldn't be surprised if most have healing properties, too. With all the bright colors, they got to be loaded with phytonutrients. I've never known any other edible flowers except zucchini and squash flowers eheheeh. Your depth of research is amazing here. Great job you have. Perhaps to introduce me to eating flowers, I should eat them first when they're put on desserts. Awesome hub! I never realize there were so many edible flowers. I have bookmarked this so I can come back and try some of these later when the garden is blooming. Living in NZ it's spring now. Best flower to eat is the lotus - well, actually the lotus root is really tasty. And lotus leaves are good for steaming proteins. Terrific article! I grow a lot of these flowers and knew some could be eaten, but I haven't really thought much about how to use them. You have certainly stirred my interest. Pinned! Thank you, "Glimmer" - I am so glad you liked it! This is really interesting. I knew about many of them, but had no idea how many others. Cool article! @anonymous: I shall do so, and so glad you liked our Lens! @LawrenceIp LM: It IS a good idea! @paulahite: Thank you, Paula! So glad you liked it! I love your lens!! I shared it on our Facebook page today too! @RewildThyself: You are welcome! I am just now getting to all of the comments! @RewildThyself: I am jealous. Mine are all gone....:( Thank you for visiting and commenting! 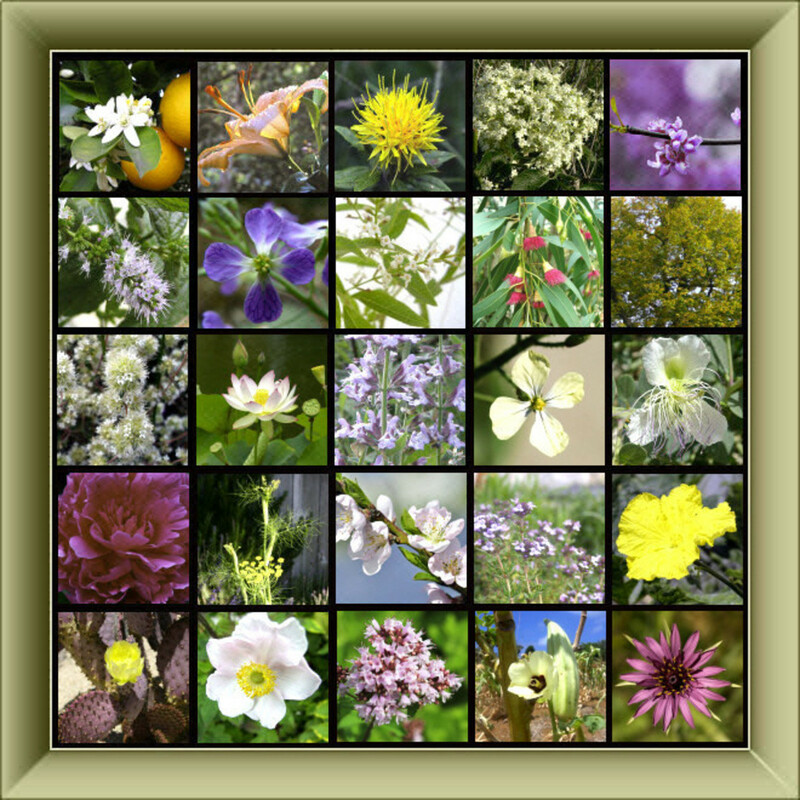 I hope you'll stop by my edible flowers page (unfortunately it won't let me link it, just put hyphens between the words in my name (dot com) and add /edible-flowers-list.html and you'll be there) and let me know what you think. I love flowers and I love this lens! @roger530: Thank you! Really gratified that you enjoyed it! @anonymous: So glad you liked the Lens! You needn't worry, about people eating all of the flowers - MOST people are not going to do it. They are not likely to break with tradition! Really loved your comment - thanks! It's a brilliant presentation. You share a new way to look up on flowers. but now i afraid losing flowers if people will start eating flowers. I think you make somebody hunger grow who always dying to test something new in his/her menu. I request to all of the reader " NOT TO EAT FLOWERS " unless nothing have left plzzzzz..
Great lens on 50 Delightful Edible Flowers. Nice presentation on edible flowers. I particularly like that you add information on what they taste like. @ViJuvenate: Thank you, ViJunvenate. I don't get back to reply a lot, but most honored by your comments! @EmmaCooper LM: Ah, Emma - bless you, and thank you! @clouda9 lm: Thank you, clouda9 - but WE think the edible flowers are incredible. Hope you enjoyed your nibbles! @Echo Phoenix: Thank you, Echo! I am so glad that you liked it! WOW! this is a gorgeous lens with a wealth of information. I particularly enjoy creating recipes with Lavender and/or Rose Petals when I play in the kitchen:) thank for sharing all this Flowery Wisdom! I had no idea so many flowers were edible! I am looking at my flower garden now in a whole new light. Definitely will be adding some beauty to my meals. @suepogson: Thank you, suepogson! I am so glad that you liked it! The banana blossoms here in Phil. called ( Puso,which is "heart" in English) and squash flower was very familiar to me here in the Philippines, especially in the Provinces were i lived, tried it in different way of cooking too. If all Filipinos knows all that different edible flowers they wont be hungry and always have something in plate. But then we don't want to loss our flowers end up endangered species. 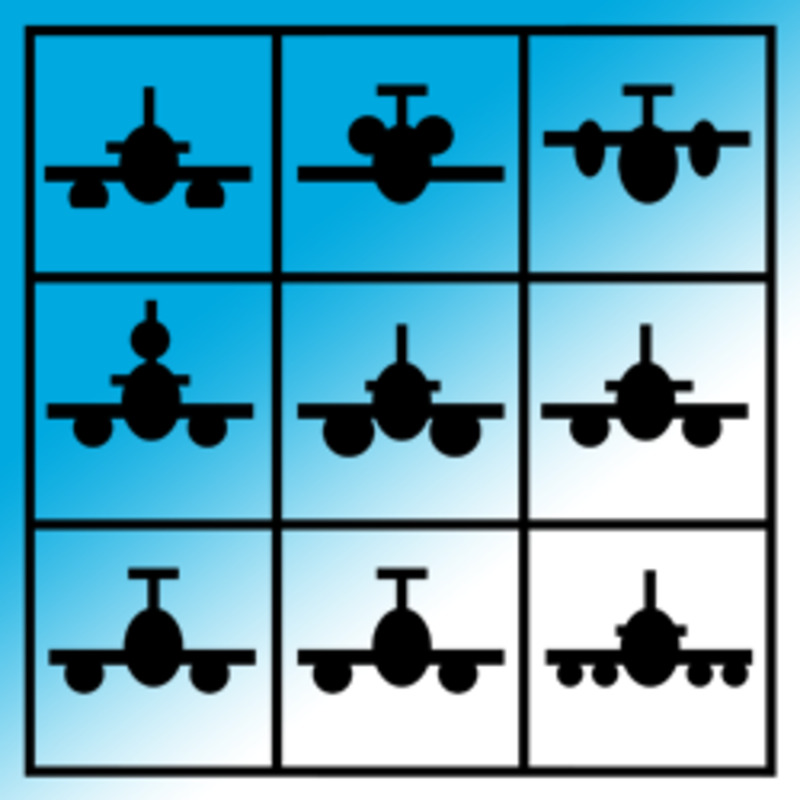 @Toy-Tester: Thank you, Toy-Tester! Glad I stopped in, to thank you...something has happened to the size of the photos, so next time you stop in, they should be fixed....appreciate your coming! Dandylions are only bitter if you get the white 'milk' on them. If you pick and eat them carefully enough to not break any of the green parts around the flower they will be sweet, not bitter. The comment about snapdragons piqued my interest. Where I might I find the citrus spiked snapdragon jam recipe? @Kapalbility: Once again, to all who voted and commented - thank you! I am simply delighted, that you like our Lens about 50 edible flowers. Hopefully, a lot of people will view the beauty all around us, with more of an "eye for edibility"! Of course. I love moringa, squash and banana blossoms. Those are delicious. Awesome lens about edible flowers. Delish. Blessed. Thank you for this delicious lens! Packed with ideas and beautiful photos. @WorldTraveling: Thank you! I am so glad that you liked it! One of the best I've seen on this topic anywhere on the web! @anonymous: Yes, they are! Most people overlook them, because they are too busy enjoying the sweet potato, itself! Stopping by, to say thank you! I am so glad that you all liked the Lens, and hope it has encouraged you to add edible flowers to your diet. Just be sure you know what you are eating, and enjoy! Wow, a gorgeously presented, beautifully photographed and comprehensive lens. I'm adding you to my featured lens on forgaged food. Thank you. Awesome Lens, very informative. Kudos. @Chocolatealchemy: Thank you! So glad you liked it, and hope you enjoy adding some of these delightful taste sensations to your daily fare! Wow, you've created an awesome fabulous Lens. I use nasturtiums in salads; but had no idea there were so MANY edible flowers. Thanks for sharing your knowledge - I'm going to grow some of these this year! I have eaten some flowers, but I had no idea that so many were edible! Looks to me like this is the GO TO reference beginning in the spring, and one to refer to when planting! Excellent! @justholidays: Thank you - all of you! I am so glad you enjoyed it, and would love to hear if any of you have incorporated Edible Flowers into your diet. After all, if you are going to plant flowers, why not plant flowers that you can eat? I just couldn't do without coming back to this excellent page that lists the 50 edible flowers that can also make your dining table more beautiful and attractive for the eyes as; after all, we eat first with our eyes. I didn't see banana blossoms( did I miss it?). We eat them fried as a side dish. Great lens. I found it because Squidoo wouldn't let me start a lens on edible flowers saying there was one already. Very informative lens. Really enjoyed the lens. I wish I had thought of it! What an informative and colourful lens. Thank you for the excellent disclosure and passion. 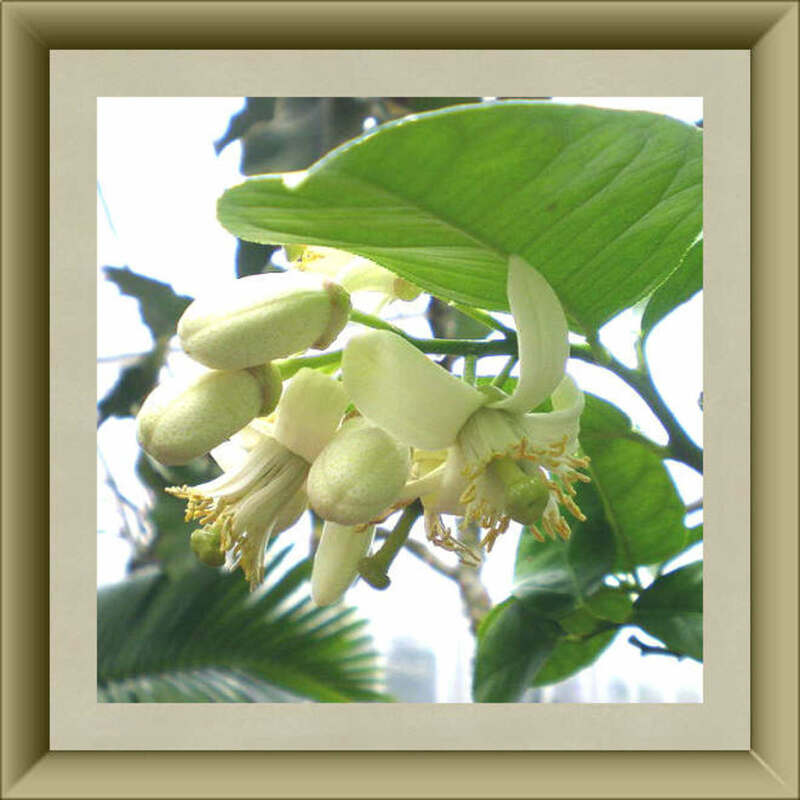 I am living in the South Pacific, wonder any tropical flowers with great aroma can be edible? anyone? Wow, this is sure full of all kinds of important information on Edible Flowers. Thank you. I sure enjoyed my visit even though I don't eat Flowers. I just never have but might one day. This lens is not only very interesting but it very beautiful. Yes! Great lens - thank you.